Chloroplasts /ˈklɔːrəˌplæsts, –plɑːsts/ are organelles that conduct photosynthesis, where the photosynthetic pigment chlorophyll captures the energy from sunlight, converts it, and stores it in the energy-storage molecules ATP and NADPH while freeing oxygen from water in plant and algal cells. They then use the ATP and NADPH to make organic molecules from carbon dioxide in a process known as the Calvin cycle. Chloroplasts carry out a number of other functions, including fatty acid synthesis, much amino acid synthesis, and the immune response in plants. The number of chloroplasts per cell varies from one, in unicellular algae, up to 100 in plants like Arabidopsis and wheat. A chloroplast is a type of organelle known as a plastid, characterized by its two membranes and a high concentration of chlorophyll. Other plastid types, such as the leucoplast and the chromoplast, contain little chlorophyll and do not carry out photosynthesis. Chloroplasts are highly dynamic—they circulate and are moved around within plant cells, and occasionally pinch in two to reproduce. Their behavior is strongly influenced by environmental factors like light color and intensity. Chloroplasts, like mitochondria, contain their own DNA, which is thought to be inherited from their ancestor—a photosynthetic cyanobacterium that was engulfed by an early eukaryotic cell. Chloroplasts cannot be made by the plant cell and must be inherited by each daughter cell during cell division. With one exception (the amoeboid Paulinella chromatophora), all chloroplasts can probably be traced back to a single endosymbiotic event, when a cyanobacterium was engulfed by the eukaryote. Despite this, chloroplasts can be found in an extremely wide set of organisms, some not even directly related to each other—a consequence of many secondary and even tertiary endosymbiotic events. The word chloroplast is derived from the Greek words chloros (χλωρός), which means green, and plastes (πλάστης), which means “the one who forms”. The first definitive description of a chloroplast (Chlorophyllkörnen, “grain of chlorophyll”) was given by Hugo von Mohl in 1837 as discrete bodies within the green plant cell. In 1883, A. F. W. Schimper would name these bodies as “chloroplastids” (Chloroplastiden). In 1884, Eduard Strasburger adopted the term “chloroplasts” (Chloroplasten). Chloroplasts are one of many types of organelles in the plant cell. They are considered to have originated from cyanobacteria through endosymbiosis—when a eukaryotic cell engulfed a photosynthesizing cyanobacterium that became a permanent resident in the cell. Mitochondria are thought to have come from a similar event, where an aerobic prokaryote was engulfed. This origin of chloroplasts was first suggested by the Russian biologist Konstantin Mereschkowski in 1905 after Andreas Schimper observed in 1883 that chloroplasts closely resemble cyanobacteria. Chloroplasts are only found in plants, algae, and the amoeboid Paulinella chromatophora. Cyanobacteria are considered the ancestors of chloroplasts. They are sometimes called blue-green algae even though they are prokaryotes. They are a diverse phylum of bacteria capable of carrying out photosynthesis, and are gram-negative, meaning that they have two cell membranes. Cyanobacteria also contain a peptidoglycan cell wall, which is thicker than in other gram-negative bacteria, and which is located between their two cell membranes. Like chloroplasts, they have thylakoids within. On the thylakoid membranes are photosynthetic pigments, including chlorophyll a. Phycobilins are also common cyanobacterial pigments, usually organized into hemispherical phycobilisomes attached to the outside of the thylakoid membranes (phycobilins are not shared with all chloroplasts though). Both chloroplasts and cyanobacteria have a double membrane, DNA, ribosomes, and thylakoids. Both the chloroplast and cyanobacterium depicted are idealized versions (the chloroplast is that of a higher plant)—a lot of diversity exists among chloroplasts and cyanobacteria. A eukaryote with mitochondria engulfed a cyanobacterium in an event of serial primary endosymbiosis, creating a lineage of cells with both organelles. It is important to note that the cyanobacterial endosymbiont already had a double membrane—the phagosomal vacuole-derived membrane was lost. a free-living cyanobacterium entered an early eukaryotic cell, either as food or as an internal parasite, but managed to escape the phagocytic vacuole it was contained in. The two innermost lipid-bilayer membranes that surround all chloroplasts correspond to the outer and inner membranes of the ancestral cyanobacterium’s gram negative cell wall, and not the phagosomal membrane from the host, which was probably lost. The new cellular resident quickly became an advantage, providing food for the eukaryotic host, which allowed it to live within it. Over time, the cyanobacterium was assimilated, and many of its genes were lost or transferred to the nucleus of the host. From genomes that probably originally contained over 3000 genes only about 130 genes remain in the chloroplasts of contemporary plants. Some of its proteins were then synthesized in the cytoplasm of the host cell, and imported back into the chloroplast (formerly the cyanobacterium). Separately, somewhere around 500 million years ago, it happened again and led to the amoeboid Paulinella chromatophora. This event is called endosymbiosis, or “cell living inside another cell with a mutual benefit for both”. The external cell is commonly referred to as the host while the internal cell is called the endosymbiont. Chloroplasts are believed to have arisen after mitochondria, since all eukaryotes contain mitochondria, but not all have chloroplasts. This is called serial endosymbiosis—an early eukaryote engulfing the mitochondrion ancestor, and some descendants of it then engulfing the chloroplast ancestor, creating a cell with both chloroplasts and mitochondria. Whether or not primary chloroplasts came from a single endosymbiotic event, or many independent engulfments across various eukaryotic lineages, has long been debated. It is now generally held that organisms with primary chloroplasts share a single ancestor that took in a cyanobacterium 600–2000 million years ago. It has been proposed this bacterium was Gloeomargarita lithophora. The exception is the amoeboid Paulinella chromatophora, which descends from an ancestor that took in a Prochlorococcus cyanobacterium 90–500 million years ago. These chloroplasts, which can be traced back directly to a cyanobacterial ancestor, are known as primary plastids (“plastid“ in this context means almost the same thing as chloroplast). All primary chloroplasts belong to one of four chloroplast lineages—the glaucophyte chloroplast lineage, the amoeboid Paulinella chromatophora lineage, the rhodophyte (red algal) chloroplast lineage, or the chloroplastidan (green) chloroplast lineage. The rhodophyte and chloroplastidan lineages are the largest, with chloroplastidan (green) being the one that contains the land plants. The alga Cyanophora, a glaucophyte, is thought to be one of the first organisms to contain a chloroplast. The glaucophyte chloroplast group is the smallest of the three primary chloroplast lineages, being found in only 13 species, and is thought to be the one that branched off the earliest. Glaucophytes have chloroplasts that retain a peptidoglycan wall between their double membranes, like their cyanobacterial parent. For this reason, glaucophyte chloroplasts are also known as ‘muroplasts’ (besides ‘cyanoplasts’ or ‘cyanelles’). Glaucophyte chloroplasts also contain concentric unstacked thylakoids, which surround a carboxysome – an icosahedral structure that glaucophyte chloroplasts and cyanobacteria keep their carbon fixation enzyme RuBisCO in. The starch that they synthesize collects outside the chloroplast. Like cyanobacteria, glaucophyte and rhodophyte chloroplast thylakoids are studded with light collecting structures called phycobilisomes. For these reasons, glaucophyte chloroplasts are considered a primitive intermediate between cyanobacteria and the more evolved chloroplasts in red algae and plants. Diversity of red algae Clockwise from top left: Bornetia secundiflora, Peyssonnelia squamaria, Cyanidium, Laurencia, Callophyllis laciniata. Red algal chloroplasts are characterized by phycobilin pigments which often give them their reddish color. The rhodophyte, or red algal chloroplast group is another large and diverse chloroplast lineage. Rhodophyte chloroplasts are also called rhodoplasts, literally “red chloroplasts”. Rhodoplasts have a double membrane with an intermembrane space and phycobilin pigments organized into phycobilisomes on the thylakoid membranes, preventing their thylakoids from stacking. Some contain pyrenoids. Rhodoplasts have chlorophyll a and phycobilins for photosynthetic pigments; the phycobilin phycoerytherin is responsible for giving many red algae their distinctive red color. However, since they also contain the blue-green chlorophyll a and other pigments, many are reddish to purple from the combination. The red phycoerytherin pigment is an adaptation to help red algae catch more sunlight in deep water—as such, some red algae that live in shallow water have less phycoerytherin in their rhodoplasts, and can appear more greenish. Rhodoplasts synthesize a form of starch called floridean starch, which collects into granules outside the rhodoplast, in the cytoplasm of the red alga. Diversity of green algae Clockwise from top left: Scenedesmus, Micrasterias, Hydrodictyon, Volvox, Stigeoclonium. Green algal chloroplasts are characterized by their pigments chlorophyll a and chlorophyll b which give them their green color. The chloroplastidan chloroplasts, or green chloroplasts, are another large, highly diverse primary chloroplast lineage. Their host organisms are commonly known as the green algae and land plants. They differ from glaucophyte and red algal chloroplasts in that they have lost their phycobilisomes, and contain chlorophyll b instead. Most green chloroplasts are (obviously) green, though some aren’t, like some forms of Hæmatococcus pluvialis, due to accessory pigments that override the chlorophylls’ green colors. Chloroplastidan chloroplasts have lost the peptidoglycan wall between their double membrane, leaving an intermembrane space. Some plants seem to have kept the genes for the synthesis of the peptidoglycan layer, though they’ve been repurposed for use in chloroplast division instead. Most of the chloroplasts depicted in this article are green chloroplasts. Green algae and plants keep their starch inside their chloroplasts, and in plants and some algae, the chloroplast thylakoids are arranged in grana stacks. Some green algal chloroplasts contain a structure called a pyrenoid, which is functionally similar to the glaucophyte carboxysome in that it is where RuBisCO and CO2 are concentrated in the chloroplast. Transmission electron micrograph of Chlamydomonas reinhardtii, a green alga that contains a pyrenoid surrounded by starch. Helicosporidium is a genus of nonphotosynthetic parasitic green algae that is thought to contain a vestigial chloroplast. Genes from a chloroplast and nuclear genes indicating the presence of a chloroplast have been found in Helicosporidium even if nobody’s seen the chloroplast itself. While most chloroplasts originate from that first set of endosymbiotic events, Paulinella chromatophora is an exception that acquired a photosynthetic cyanobacterial endosymbiont more recently. It is not clear whether that symbiont is closely related to the ancestral chloroplast of other eukaryotes. Being in the early stages of endosymbiosis, Paulinella chromatophora can offer some insights into how chloroplasts evolved. Paulinella cells contain one or two sausage shaped blue-green photosynthesizing structures called chromatophores, descended from the cyanobacterium Synechococcus. Chromatophores cannot survive outside their host. Chromatophore DNA is about a million base pairs long, containing around 850 protein encoding genes—far less than the three million base pair Synechococcus genome, but much larger than the approximately 150,000 base pair genome of the more assimilated chloroplast. Chromatophores have transferred much less of their DNA to the nucleus of their host. About 0.3–0.8% of the nuclear DNA in Paulinella is from the chromatophore, compared with 11–14% from the chloroplast in plants. Many other organisms obtained chloroplasts from the primary chloroplast lineages through secondary endosymbiosis—engulfing a red or green alga that contained a chloroplast. These chloroplasts are known as secondary plastids. While primary chloroplasts have a double membrane from their cyanobacterial ancestor, secondary chloroplasts have additional membranes outside of the original two, as a result of the secondary endosymbiotic event, when a nonphotosynthetic eukaryote engulfed a chloroplast-containing alga but failed to digest it—much like the cyanobacterium at the beginning of this story. The engulfed alga was broken down, leaving only its chloroplast, and sometimes its cell membrane and nucleus, forming a chloroplast with three or four membranes—the two cyanobacterial membranes, sometimes the eaten alga’s cell membrane, and the phagosomal vacuole from the host’s cell membrane. Secondary endosymbiosis consisted of a eukaryotic alga being engulfed by another eukaryote, forming a chloroplast with three or four membranes. The genes in the phagocytosed eukaryote’s nucleus are often transferred to the secondary host’s nucleus. Cryptomonads and chlorarachniophytes retain the phagocytosed eukaryote’s nucleus, an object called a nucleomorph, located between the second and third membranes of the chloroplast. All secondary chloroplasts come from green and red algae—no secondary chloroplasts from glaucophytes have been observed, probably because glaucophytes are relatively rare in nature, making them less likely to have been taken up by another eukaryote. Green algae have been taken up by the euglenids, chlorarachniophytes, a lineage of dinoflagellates, and possibly the ancestor of the CASH lineage (cryptomonads, alveolates, stramenopiles and haptophytes) in three or four separate engulfments. Many green algal derived chloroplasts contain pyrenoids, but unlike chloroplasts in their green algal ancestors, storage product collects in granules outside the chloroplast. Euglena, a euglenophyte, contains secondary chloroplasts from green algae. Euglenophytes are a group of common flagellated protists that contain chloroplasts derived from a green alga. Euglenophyte chloroplasts have three membranes—it is thought that the membrane of the primary endosymbiont was lost, leaving the cyanobacterial membranes, and the secondary host’s phagosomal membrane. Euglenophyte chloroplasts have a pyrenoid and thylakoids stacked in groups of three. Photosynthetic product is stored in the form of paramylon, which is contained in membrane-bound granules in the cytoplasm of the euglenophyte. Chlorarachnion reptans is a chlorarachniophyte. Chlorarachniophytes replaced their original red algal endosymbiont with a green alga. Chlorarachniophytes /ˌklɔːrəˈræknioʊˌfaɪts/ are a rare group of organisms that also contain chloroplasts derived from green algae, though their story is more complicated than that of the euglenophytes. The ancestor of chlorarachniophytes is thought to have been a eukaryote with a red algal derived chloroplast. It is then thought to have lost its first red algal chloroplast, and later engulfed a green alga, giving it its second, green algal derived chloroplast. Chlorarachniophyte chloroplasts are bounded by four membranes, except near the cell membrane, where the chloroplast membranes fuse into a double membrane. Their thylakoids are arranged in loose stacks of three. Chlorarachniophytes have a form of polysaccharide called chrysolaminarin, which they store in the cytoplasm, often collected around the chloroplast pyrenoid, which bulges into the cytoplasm. Chlorarachniophyte chloroplasts are notable because the green alga they are derived from has not been completely broken down—its nucleus still persists as a nucleomorph found between the second and third chloroplast membranes—the periplastid space, which corresponds to the green alga’s cytoplasm. Lepidodinium viride and its close relatives are dinophytes (see below) that lost their original peridinin chloroplast and replaced it with a green algal derived chloroplast (more specifically, a prasinophyte). Lepidodinium is the only dinophyte that has a chloroplast that’s not from the rhodoplast lineage. The chloroplast is surrounded by two membranes and has no nucleomorph—all the nucleomorph genes have been transferred to the dinophyte nucleus. The endosymbiotic event that led to this chloroplast was serial secondary endosymbiosis rather than tertiary endosymbiosis—the endosymbiont was a green alga containing a primary chloroplast (making a secondary chloroplast). Cryptophytes, or cryptomonads are a group of algae that contain a red-algal derived chloroplast. Cryptophyte chloroplasts contain a nucleomorph that superficially resembles that of the chlorarachniophytes. Cryptophyte chloroplasts have four membranes, the outermost of which is continuous with the rough endoplasmic reticulum. They synthesize ordinary starch, which is stored in granules found in the periplastid space—outside the original double membrane, in the place that corresponds to the red alga’s cytoplasm. Inside cryptophyte chloroplasts is a pyrenoid and thylakoids in stacks of two. Their chloroplasts do not have phycobilisomes, but they do have phycobilin pigments which they keep in their thylakoid space, rather than anchored on the outside of their thylakoid membranes. Cryptophytes may have played a key role in the spreading of red algal based chloroplasts. Haptophytes are similar and closely related to cryptophytes or heterokontophytes. Their chloroplasts lack a nucleomorph, their thylakoids are in stacks of three, and they synthesize chrysolaminarin sugar, which they store completely outside of the chloroplast, in the cytoplasm of the haptophyte. The photosynthetic pigments present in their chloroplasts give diatoms a greenish-brown color. The heterokontophytes, also known as the stramenopiles, are a very large and diverse group of eukaryotes. The photoautotrophic lineage, Ochrophyta, including the diatoms and the brown algae, golden algae, and yellow-green algae, also contains red algal derived chloroplasts. Heterokont chloroplasts are very similar to haptophyte chloroplasts, containing a pyrenoid, triplet thylakoids, and with some exceptions, having four layer plastidic envelope, the outermost epiplastid membrane connected to the endoplasmic reticulum. Like haptophytes, heterokontophytes store sugar in chrysolaminarin granules in the cytoplasm. Heterokontophyte chloroplasts contain chlorophyll a and with a few exceptions chlorophyll c, but also have carotenoids which give them their many colors. Circles represent endosymbiotic events. For clarity, dinophyte tertiary endosymbioses and many nonphotosynthetic lineages have been omitted. a It is now established that Chromalveolata is paraphyletic to Rhizaria. The alveolates are a major clade of unicellular eukaryotes of both autotrophic and heterotrophic members. The most notable shared characteristic is the presence of cortical (outer-region) alveoli (sacs). These are flattened vesicles (sacs) packed into a continuous layer just under the membrane and supporting it, typically forming a flexible pellicle (thin skin). In dinoflagellates they often form armor plates. Many members contain a red-algal derived plastid. One notable characteristic of this diverse group is the frequent loss of photosynthesis. However, a majority of these heterotrophs continue to process a non-photosynthetic plastid. Apicomplexans are a group of alveolates. Like the helicosproidia, they’re parasitic, and have a nonphotosynthetic chloroplast. They were once thought to be related to the helicosproidia, but it is now known that the helicosproida are green algae rather than part of the CASH lineage. The apicomplexans include Plasmodium, the malaria parasite. Many apicomplexans keep a vestigial red algal derived chloroplast called an apicoplast, which they inherited from their ancestors. Other apicomplexans like Cryptosporidium have lost the chloroplast completely. Apicomplexans store their energy in amylopectin granules that are located in their cytoplasm, even though they are nonphotosynthetic. Apicoplasts have lost all photosynthetic function, and contain no photosynthetic pigments or true thylakoids. They are bounded by four membranes, but the membranes are not connected to the endoplasmic reticulum. The fact that apicomplexans still keep their nonphotosynthetic chloroplast around demonstrates how the chloroplast carries out important functions other than photosynthesis. Plant chloroplasts provide plant cells with many important things besides sugar, and apicoplasts are no different—they synthesize fatty acids, isopentenyl pyrophosphate, iron-sulfur clusters, and carry out part of the heme pathway. This makes the apicoplast an attractive target for drugs to cure apicomplexan-related diseases. The most important apicoplast function is isopentenyl pyrophosphate synthesis—in fact, apicomplexans die when something interferes with this apicoplast function, and when apicomplexans are grown in an isopentenyl pyrophosphate-rich medium, they dump the organelle. The Chromerida is a newly discovered group of algae from Australian corals which comprises some close photosynthetic relatives of the apicomplexans. The first member, Chromera velia, was discovered and first isolated in 2001. The discovery of Chromera velia with similar structure to the apicomplexanss, provides an important link in the evolutionary history of the apicomplexans and dinophytes. Their plastids have four membranes, lack chlorophyll c and use the type II form of RuBisCO obtained from a horizontal transfer event. The dinoflagellates are yet another very large and diverse group of protists, around half of which are (at least partially) photosynthetic. Most dinophyte chloroplasts are secondary red algal derived chloroplasts. Many other dinophytes have lost the chloroplast (becoming the nonphotosynthetic kind of dinoflagellate), or replaced it though tertiary endosymbiosis—the engulfment of another eukaryotic algae containing a red algal derived chloroplast. Others replaced their original chloroplast with a green algal derived one. Most dinophyte chloroplasts contain form II RuBisCO, at least the photosynthetic pigments chlorophyll a, chlorophyll c2, beta-carotene, and at least one dinophyte-unique xanthophyll (peridinin, dinoxanthin, or diadinoxanthin), giving many a golden-brown color. All dinophytes store starch in their cytoplasm, and most have chloroplasts with thylakoids arranged in stacks of three. The most common dinophyte chloroplast is the peridinin-type chloroplast, characterized by the carotenoid pigment peridinin in their chloroplasts, along with chlorophyll a and chlorophyll c2. Peridinin is not found in any other group of chloroplasts. The peridinin chloroplast is bounded by three membranes (occasionally two), having lost the red algal endosymbiont’s original cell membrane. The outermost membrane is not connected to the endoplasmic reticulum. They contain a pyrenoid, and have triplet-stacked thylakoids. Starch is found outside the chloroplast. An important feature of these chloroplasts is that their chloroplast DNA is highly reduced and fragmented into many small circles. Most of the genome has migrated to the nucleus, and only critical photosynthesis-related genes remain in the chloroplast. The peridinin chloroplast is thought to be the dinophytes’ “original” chloroplast, which has been lost, reduced, replaced, or has company in several other dinophyte lineages. Karenia brevis is a fucoxanthin-containing dynophyte responsible for algal blooms called “red tides“. The fucoxanthin dinophyte lineages (including Karlodinium and Karenia) lost their original red algal derived chloroplast, and replaced it with a new chloroplast derived from a haptophyte endosymbiont. Karlodinium and Karenia probably took up different heterokontophytes. Because the haptophyte chloroplast has four membranes, tertiary endosymbiosis would be expected to create a six membraned chloroplast, adding the haptophyte’s cell membrane and the dinophyte’s phagosomal vacuole. However, the haptophyte was heavily reduced, stripped of a few membranes and its nucleus, leaving only its chloroplast (with its original double membrane), and possibly one or two additional membranes around it. Fucoxanthin-containing chloroplasts are characterized by having the pigment fucoxanthin (actually 19′-hexanoyloxy-fucoxanthin and/or 19′-butanoyloxy-fucoxanthin) and no peridinin. Fucoxanthin is also found in haptophyte chloroplasts, providing evidence of ancestry. Dinophysis acuminata has chloroplasts taken from a cryptophyte. Some dinophytes, like Kryptoperidinium and Durinskia have a diatom (heterokontophyte) derived chloroplast. These chloroplasts are bounded by up to five membranes, (depending on whether you count the entire diatom endosymbiont as the chloroplast, or just the red algal derived chloroplast inside it). The diatom endosymbiont has been reduced relatively little—it still retains its original mitochondria, and has endoplasmic reticulum, ribosomes, a nucleus, and of course, red algal derived chloroplasts—practically a complete cell, all inside the host’s endoplasmic reticulum lumen. However the diatom endosymbiont can’t store its own food—its storage polysaccharide is found in granules in the dinophyte host’s cytoplasm instead. The diatom endosymbiont’s nucleus is present, but it probably can’t be called a nucleomorph because it shows no sign of genome reduction, and might have even been expanded. Diatoms have been engulfed by dinoflagellates at least three times. The diatom endosymbiont is bounded by a single membrane, inside it are chloroplasts with four membranes. Like the diatom endosymbiont’s diatom ancestor, the chloroplasts have triplet thylakoids and pyrenoids. In some of these genera, the diatom endosymbiont’s chloroplasts aren’t the only chloroplasts in the dinophyte. The original three-membraned peridinin chloroplast is still around, converted to an eyespot. In some groups of mixotrophic protists, like some dinoflagellates (e.g. Dinophysis), chloroplasts are separated from a captured alga and used temporarily. These klepto chloroplasts may only have a lifetime of a few days and are then replaced. Members of the genus Dinophysis have a phycobilin-containing chloroplast taken from a cryptophyte. However, the cryptophyte is not an endosymbiont—only the chloroplast seems to have been taken, and the chloroplast has been stripped of its nucleomorph and outermost two membranes, leaving just a two-membraned chloroplast. Cryptophyte chloroplasts require their nucleomorph to maintain themselves, and Dinophysis species grown in cell culture alone cannot survive, so it is possible (but not confirmed) that the Dinophysis chloroplast is a kleptoplast—if so, Dinophysis chloroplasts wear out and Dinophysis species must continually engulf cryptophytes to obtain new chloroplasts to replace the old ones. Chloroplasts have their own DNA, often abbreviated as ctDNA, or cpDNA. It is also known as the plastome. Its existence was first proved in 1962, and first sequenced in 1986—when two Japanese research teams sequenced the chloroplast DNA of liverwort and tobacco. Since then, hundreds of chloroplast DNAs from various species have been sequenced, but they are mostly those of land plants and green algae—glaucophytes, red algae, and other algal groups are extremely underrepresented, potentially introducing some bias in views of “typical” chloroplast DNA structure and content. Chloroplast DNA Interactive gene map of chloroplast DNA from Nicotiana tabacum. Segments with labels on the inside reside on the B strand of DNA, segments with labels on the outside are on the A strand. Notches indicate introns. With few exceptions, most chloroplasts have their entire chloroplast genome combined into a single large circular DNA molecule, typically 120,000–170,000 base pairs long. They can have a contour length of around 30–60 micrometers, and have a mass of about 80–130 million daltons. While usually thought of as a circular molecule, there is some evidence that chloroplast DNA molecules more often take on a linear shape. Many chloroplast DNAs contain two inverted repeats, which separate a long single copy section (LSC) from a short single copy section (SSC). While a given pair of inverted repeats are rarely completely identical, they are always very similar to each other, apparently resulting from concerted evolution. The inverted repeats vary wildly in length, ranging from 4,000 to 25,000 base pairs long each and containing as few as four or as many as over 150 genes. Inverted repeats in plants tend to be at the upper end of this range, each being 20,000–25,000 base pairs long. The inverted repeat regions are highly conserved among land plants, and accumulate few mutations. Similar inverted repeats exist in the genomes of cyanobacteria and the other two chloroplast lineages (glaucophyta and rhodophyceae), suggesting that they predate the chloroplast, though some chloroplast DNAs have since lost or flipped the inverted repeats (making them direct repeats). It is possible that the inverted repeats help stabilize the rest of the chloroplast genome, as chloroplast DNAs which have lost some of the inverted repeat segments tend to get rearranged more. New chloroplasts may contain up to 100 copies of their DNA, though the number of chloroplast DNA copies decreases to about 15–20 as the chloroplasts age. They are usually packed into nucleoids, which can contain several identical chloroplast DNA rings. Many nucleoids can be found in each chloroplast. In primitive red algae, the chloroplast DNA nucleoids are clustered in the center of the chloroplast, while in green plants and green algae, the nucleoids are dispersed throughout the stroma. Though chloroplast DNA is not associated with true histones, in red algae, similar proteins that tightly pack each chloroplast DNA ring into a nucleoid have been found. In chloroplasts of the moss Physcomitrella patens, the DNA mismatch repair protein Msh1 interacts with the recombinational repair proteins RecA and RecG to maintain chloroplast genome stability. In chloroplasts of the plant Arabidopsis thaliana the RecA protein maintains the integrity of the chloroplast’s DNA by a process that likely involves the recombinational repair of DNA damage. The mechanism for chloroplast DNA (cpDNA) replication has not been conclusively determined, but two main models have been proposed. Scientists have attempted to observe chloroplast replication via electron microscopy since the 1970s. The results of the microscopy experiments led to the idea that chloroplast DNA replicates using a double displacement loop (D-loop). As the D-loop moves through the circular DNA, it adopts a theta intermediary form, also known as a Cairns replication intermediate, and completes replication with a rolling circle mechanism. Transcription starts at specific points of origin. Multiple replication forks open up, allowing replication machinery to transcribe the DNA. As replication continues, the forks grow and eventually converge. The new cpDNA structures separate, creating daughter cpDNA chromosomes. In addition to the early microscopy experiments, this model is also supported by the amounts of deamination seen in cpDNA. Deamination occurs when an amino group is lost and is a mutation that often results in base changes. When adenine is deaminated, it becomes hypoxanthine. Hypoxanthine can bind to cytosine, and when the XC base pair is replicated, it becomes a GC (thus, an A → G base change). Over time, base changes in the DNA sequence can arise from deamination mutations. When adenine is deaminated, it becomes hypoxanthine, which can pair with cytosine. During replication, the cytosine will pair with guanine, causing an A –> G base change. In cpDNA, there are several A → G deamination gradients. DNA becomes susceptible to deamination events when it is single stranded. When replication forks form, the strand not being copied is single stranded, and thus at risk for A → G deamination. Therefore, gradients in deamination indicate that replication forks were most likely present and the direction that they initially opened (the highest gradient is most likely nearest the start site because it was single stranded for the longest amount of time). This mechanism is still the leading theory today; however, a second theory suggests that most cpDNA is actually linear and replicates through homologous recombination. It further contends that only a minority of the genetic material is kept in circular chromosomes while the rest is in branched, linear, or other complex structures. One of competing model for cpDNA replication asserts that most cpDNA is linear and participates in homologous recombination and replication structures similar to the linear and circular DNA structures of bacteriophage T4. It has been established that some plants have linear cpDNA, such as maize, and that more species still contain complex structures that scientists do not yet understand. When the original experiments on cpDNA were performed, scientists did notice linear structures; however, they attributed these linear forms to broken circles. If the branched and complex structures seen in cpDNA experiments are real and not artifacts of concatenated circular DNA or broken circles, then a D-loop mechanism of replication is insufficient to explain how those structures would replicate. At the same time, homologous recombination does not expand the multiple A –> G gradients seen in plastomes. Because of the failure to explain the deamination gradient as well as the numerous plant species that have been shown to have circular cpDNA, the predominant theory continues to hold that most cpDNA is circular and most likely replicates via a D loop mechanism. The chloroplast genome most commonly includes around 100 genes that code for a variety of things, mostly to do with the protein pipeline and photosynthesis. As in prokaryotes, genes in chloroplast DNA are organized into operons. Unlike prokaryotic DNA molecules, chloroplast DNA molecules contain introns (plant mitochondrial DNAs do too, but not human mtDNAs). Among land plants, the contents of the chloroplast genome are fairly similar. Over time, many parts of the chloroplast genome were transferred to the nuclear genome of the host, a process called endosymbiotic gene transfer. As a result, the chloroplast genome is heavily reduced compared to that of free-living cyanobacteria. Chloroplasts may contain 60–100 genes whereas cyanobacteria often have more than 1500 genes in their genome. Recently, a plastid without a genome was found, demonstrating chloroplasts can lose their genome during endosymbiotic the gene transfer process. Endosymbiotic gene transfer is how we know about the lost chloroplasts in many CASH lineages. Even if a chloroplast is eventually lost, the genes it donated to the former host’s nucleus persist, providing evidence for the lost chloroplast’s existence. For example, while diatoms (a heterokontophyte) now have a red algal derived chloroplast, the presence of many green algal genes in the diatom nucleus provide evidence that the diatom ancestor had a green algal derived chloroplast at some point, which was subsequently replaced by the red chloroplast. In land plants, some 11–14% of the DNA in their nuclei can be traced back to the chloroplast, up to 18% in Arabidopsis, corresponding to about 4,500 protein-coding genes. There have been a few recent transfers of genes from the chloroplast DNA to the nuclear genome in land plants. Of the approximately 3000 proteins found in chloroplasts, some 95% of them are encoded by nuclear genes. Many of the chloroplast’s protein complexes consist of subunits from both the chloroplast genome and the host’s nuclear genome. As a result, protein synthesis must be coordinated between the chloroplast and the nucleus. The chloroplast is mostly under nuclear control, though chloroplasts can also give out signals regulating gene expression in the nucleus, called retrograde signaling. Protein synthesis within chloroplasts relies on two RNA polymerases. One is coded by the chloroplast DNA, the other is of nuclear origin. The two RNA polymerases may recognize and bind to different kinds of promoters within the chloroplast genome. The ribosomes in chloroplasts are similar to bacterial ribosomes. Because so many chloroplast genes have been moved to the nucleus, many proteins that would originally have been translated in the chloroplast are now synthesized in the cytoplasm of the plant cell. These proteins must be directed back to the chloroplast, and imported through at least two chloroplast membranes. Curiously, around half of the protein products of transferred genes aren’t even targeted back to the chloroplast. Many became exaptations, taking on new functions like participating in cell division, protein routing, and even disease resistance. A few chloroplast genes found new homes in the mitochondrial genome—most became nonfunctional pseudogenes, though a few tRNA genes still work in the mitochondrion. Some transferred chloroplast DNA protein products get directed to the secretory pathway though it should be noted that many secondary plastids are bounded by an outermost membrane derived from the host’s cell membrane, and therefore topologically outside of the cell, because to reach the chloroplast from the cytosol, you have to cross the cell membrane, just like if you were headed for the extracellular space. In those cases, chloroplast-targeted proteins do initially travel along the secretory pathway. Because the cell acquiring a chloroplast already had mitochondria (and peroxisomes, and a cell membrane for secretion), the new chloroplast host had to develop a unique protein targeting system to avoid having chloroplast proteins being sent to the wrong organelle. The two ends of a polypeptide are called the N-terminus, or amino end, and the C-terminus, or carboxyl end. This polypeptide has four amino acids linked together. At the left is the N-terminus, with its amino (H2N) group in green. The blue C-terminus, with its carboxyl group (CO2H) is at the right. In most, but not all cases, nuclear-encoded chloroplast proteins are translated with a cleavable transit peptide that’s added to the N-terminus of the protein precursor. Sometimes the transit sequence is found on the C-terminus of the protein, or within the functional part of the protein. After a chloroplast polypeptide is synthesized on a ribosome in the cytosol, an enzyme specific to chloroplast proteins phosphorylates, or adds a phosphate group to many (but not all) of them in their transit sequences. Phosphorylation helps many proteins bind the polypeptide, keeping it from folding prematurely. This is important because it prevents chloroplast proteins from assuming their active form and carrying out their chloroplast functions in the wrong place—the cytosol. At the same time, they have to keep just enough shape so that they can be recognized by the chloroplast. These proteins also help the polypeptide get imported into the chloroplast. From here, chloroplast proteins bound for the stroma must pass through two protein complexes—the TOC complex, or translocon on the outer chloroplast membrane, and the TIC translocon, or translocon on the inner chloroplast membrane translocon. Chloroplast polypeptide chains probably often travel through the two complexes at the same time, but the TIC complex can also retrieve preproteins lost in the intermembrane space. Transmission electron microscope image of a chloroplast. Grana of thylakoids and their connecting lamellae are clearly visible. In land plants, chloroplasts are generally lens-shaped, 3–10 μm in diameter and 1–3 μm thick. Corn seedling chloroplasts are ≈20 µm3 in volume. Greater diversity in chloroplast shapes exists among the algae, which often contain a single chloroplast that can be shaped like a net (e.g., Oedogonium), a cup (e.g., Chlamydomonas), a ribbon-like spiral around the edges of the cell (e.g., Spirogyra), or slightly twisted bands at the cell edges (e.g., Sirogonium). Some algae have two chloroplasts in each cell; they are star-shaped in Zygnema, or may follow the shape of half the cell in order Desmidiales. In some algae, the chloroplast takes up most of the cell, with pockets for the nucleus and other organelles, for example, some species of Chlorella have a cup-shaped chloroplast that occupies much of the cell. All chloroplasts have at least three membrane systems—the outer chloroplast membrane, the inner chloroplast membrane, and the thylakoid system. Chloroplasts that are the product of secondary endosymbiosis may have additional membranes surrounding these three. Inside the outer and inner chloroplast membranes is the chloroplast stroma, a semi-gel-like fluid that makes up much of a chloroplast’s volume, and in which the thylakoid system floats. 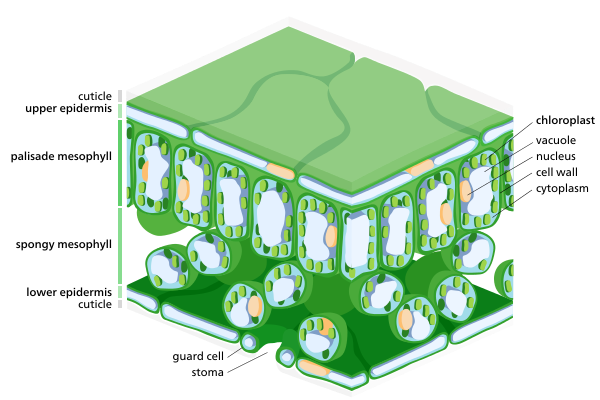 Chloroplast ultrastructure (interactive diagram) Chloroplasts have at least three distinct membrane systems, and a variety of things can be found in their stroma. There are some common misconceptions about the outer and inner chloroplast membranes. The fact that chloroplasts are surrounded by a double membrane is often cited as evidence that they are the descendants of endosymbiotic cyanobacteria. This is often interpreted as meaning the outer chloroplast membrane is the product of the host’s cell membrane infolding to form a vesicle to surround the ancestral cyanobacterium—which is not true—both chloroplast membranes are homologous to the cyanobacterium’s original double membranes. The chloroplast double membrane is also often compared to the mitochondrial double membrane. This is not a valid comparison—the inner mitochondria membrane is used to run proton pumps and carry out oxidative phosphorylation across to generate ATP energy. The only chloroplast structure that can considered analogous to it is the internal thylakoid system. Even so, in terms of “in-out”, the direction of chloroplast H+ ion flow is in the opposite direction compared to oxidative phosphorylation in mitochondria. In addition, in terms of function, the inner chloroplast membrane, which regulates metabolite passage and synthesizes some materials, has no counterpart in the mitochondrion. The outer chloroplast membrane is a semi-porous membrane that small molecules and ions can easily diffuse across. However, it is not permeable to larger proteins, so chloroplast polypeptides being synthesized in the cell cytoplasm must be transported across the outer chloroplast membrane by the TOC complex, or translocon on the outer chloroplast membrane. The chloroplast membranes sometimes protrude out into the cytoplasm, forming a stromule, or stroma-containing tubule. Stromules are very rare in chloroplasts, and are much more common in other plastids like chromoplasts and amyloplasts in petals and roots, respectively. They may exist to increase the chloroplast’s surface area for cross-membrane transport, because they are often branched and tangled with the endoplasmic reticulum. When they were first observed in 1962, some plant biologists dismissed the structures as artifactual, claiming that stromules were just oddly shaped chloroplasts with constricted regions or dividing chloroplasts. However, there is a growing body of evidence that stromules are functional, integral features of plant cell plastids, not merely artifacts. Usually, a thin intermembrane space about 10–20 nanometers thick exists between the outer and inner chloroplast membranes. Glaucophyte algal chloroplasts have a peptidoglycan layer between the chloroplast membranes. It corresponds to the peptidoglycan cell wall of their cyanobacterial ancestors, which is located between their two cell membranes. These chloroplasts are called muroplasts (from Latin “mura”, meaning “wall”). Other chloroplasts have lost the cyanobacterial wall, leaving an intermembrane space between the two chloroplast envelope membranes. The inner chloroplast membrane borders the stroma and regulates passage of materials in and out of the chloroplast. After passing through the TOC complex in the outer chloroplast membrane, polypeptides must pass through the TIC complex (translocon on the inner chloroplast membrane) which is located in the inner chloroplast membrane. In addition to regulating the passage of materials, the inner chloroplast membrane is where fatty acids, lipids, and carotenoids are synthesized. Some chloroplasts contain a structure called the chloroplast peripheral reticulum. It is often found in the chloroplasts of C4 plants, though it has also been found in some C3 angiosperms, and even some gymnosperms. The chloroplast peripheral reticulum consists of a maze of membranous tubes and vesicles continuous with the inner chloroplast membrane that extends into the internal stromal fluid of the chloroplast. Its purpose is thought to be to increase the chloroplast’s surface area for cross-membrane transport between its stroma and the cell cytoplasm. The small vesicles sometimes observed may serve as transport vesicles to shuttle stuff between the thylakoids and intermembrane space. The protein-rich, alkaline, aqueous fluid within the inner chloroplast membrane and outside of the thylakoid space is called the stroma, which corresponds to the cytosol of the original cyanobacterium. Nucleoids of chloroplast DNA, chloroplast ribosomes, the thylakoid system with plastoglobuli, starch granules, and many proteins can be found floating around in it. The Calvin cycle, which fixes CO2 into sugar takes place in the stroma. Chloroplast ribosomes Comparison of a chloroplast ribosome (green) and a bacterial ribosome (yellow). Important features common to both ribosomes and chloroplast-unique features are labeled. Chloroplasts have their own ribosomes, which they use to synthesize a small fraction of their proteins. Chloroplast ribosomes are about two-thirds the size of cytoplasmic ribosomes (around 17 nm vs 25 nm). They take mRNAs transcribed from the chloroplast DNA and translate them into protein. While similar to bacterial ribosomes, chloroplast translation is more complex than in bacteria, so chloroplast ribosomes include some chloroplast-unique features. Small subunit ribosomal RNAs in several Chlorophyta and euglenid chloroplasts lack motifs for shine-dalgarno sequence recognition, which is considered essential for translation initiation in most chloroplasts and prokaryotes. Such loss is also rarely observed in other plastids and prokaryotes. Plastoglobuli (singular plastoglobulus, sometimes spelled plastoglobule(s)), are spherical bubbles of lipids and proteins about 45–60 nanometers across. They are surrounded by a lipid monolayer. Plastoglobuli are found in all chloroplasts, but become more common when the chloroplast is under oxidative stress, or when it ages and transitions into a gerontoplast. Plastoglobuli also exhibit a greater size variation under these conditions. They are also common in etioplasts, but decrease in number as the etioplasts mature into chloroplasts. Plastoglubuli contain both structural proteins and enzymes involved in lipid synthesis and metabolism. They contain many types of lipids including plastoquinone, vitamin E, carotenoids and chlorophylls. Plastoglobuli were once thought to be free-floating in the stroma, but it is now thought that they are permanently attached either to a thylakoid or to another plastoglobulus attached to a thylakoid, a configuration that allows a plastoglobulus to exchange its contents with the thylakoid network. In normal green chloroplasts, the vast majority of plastoglobuli occur singularly, attached directly to their parent thylakoid. In old or stressed chloroplasts, plastoglobuli tend to occur in linked groups or chains, still always anchored to a thylakoid. Plastoglobuli form when a bubble appears between the layers of the lipid bilayer of the thylakoid membrane, or bud from existing plastoglubuli—though they never detach and float off into the stroma. Practically all plastoglobuli form on or near the highly curved edges of the thylakoid disks or sheets. They are also more common on stromal thylakoids than on granal ones. Starch granules are very common in chloroplasts, typically taking up 15% of the organelle’s volume, though in some other plastids like amyloplasts, they can be big enough to distort the shape of the organelle. Starch granules are simply accumulations of starch in the stroma, and are not bounded by a membrane. Starch granules appear and grow throughout the day, as the chloroplast synthesizes sugars, and are consumed at night to fuel respiration and continue sugar export into the phloem, though in mature chloroplasts, it is rare for a starch granule to be completely consumed or for a new granule to accumulate. Starch granules vary in composition and location across different chloroplast lineages. In red algae, starch granules are found in the cytoplasm rather than in the chloroplast. In C4 plants, mesophyll chloroplasts, which do not synthesize sugars, lack starch granules. RuBisCO, shown here in a space-filling model, is the main enzyme responsible for carbon fixation in chloroplasts. The chloroplast stroma contains many proteins, though the most common and important is RuBisCO, which is probably also the most abundant protein on the planet. 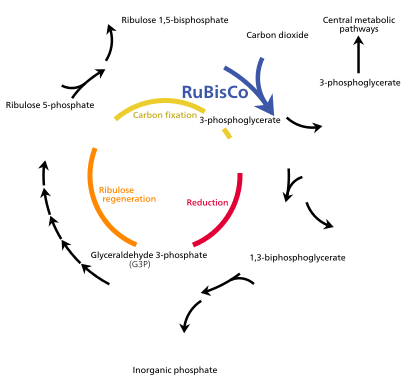 RuBisCO is the enzyme that fixes CO2 into sugar molecules. In C3 plants, RuBisCO is abundant in all chloroplasts, though in C4 plants, it is confined to the bundle sheath chloroplasts, where the Calvin cycle is carried out in C4 plants. The chloroplasts of some hornworts and algae contain structures called pyrenoids. They are not found in higher plants. Pyrenoids are roughly spherical and highly refractive bodies which are a site of starch accumulation in plants that contain them. They consist of a matrix opaque to electrons, surrounded by two hemispherical starch plates. The starch is accumulated as the pyrenoids mature. In algae with carbon concentrating mechanisms, the enzyme RuBisCO is found in the pyrenoids. Starch can also accumulate around the pyrenoids when CO2 is scarce. Pyrenoids can divide to form new pyrenoids, or be produced “de novo”. Transmission electron microscope image of some thylakoids arranged in grana stacks and lamellæ. Plastoglobuli (dark blobs) are also present. Suspended within the chloroplast stroma is the thylakoid system, a highly dynamic collection of membranous sacks called thylakoids where chlorophyll is found and the light reactions of photosynthesis happen. In most vascular plant chloroplasts, the thylakoids are arranged in stacks called grana, though in certain C4 plant chloroplasts and some algal chloroplasts, the thylakoids are free floating. Using a light microscope, it is just barely possible to see tiny green granules—which were named grana. With electron microscopy, it became possible to see the thylakoid system in more detail, revealing it to consist of stacks of flat thylakoids which made up the grana, and long interconnecting stromal thylakoids which linked different grana. In the transmission electron microscope, thylakoid membranes appear as alternating light-and-dark bands, 8.5 nanometers thick. For a long time, the three-dimensional structure of the thylakoid system has been unknown or disputed. One model has the granum as a stack of thylakoids linked by helical stromal thylakoids; the other has the granum as a single folded thylakoid connected in a “hub and spoke” way to other grana by stromal thylakoids. While the thylakoid system is still commonly depicted according to the folded thylakoid model, it was determined in 2011 that the stacked and helical thylakoids model is correct. Granum structure The prevailing model for granal structure is a stack of granal thylakoids linked by helical stromal thylakoids that wrap around the grana stacks and form large sheets that connect different grana. In the helical thylakoid model, grana consist of a stack of flattened circular granal thylakoids that resemble pancakes. Each granum can contain anywhere from two to a hundred thylakoids, though grana with 10–20 thylakoids are most common. Wrapped around the grana are helicoid stromal thylakoids, also known as frets or lamellar thylakoids. The helices ascend at an angle of 20–25°, connecting to each granal thylakoid at a bridge-like slit junction. The helicoids may extend as large sheets that link multiple grana, or narrow to tube-like bridges between grana. While different parts of the thylakoid system contain different membrane proteins, the thylakoid membranes are continuous and the thylakoid space they enclose form a single continuous labyrinth. Thylakoids (sometimes spelled thylakoïds), are small interconnected sacks which contain the membranes that the light reactions of photosynthesis take place on. The word thylakoid comes from the Greek word thylakos which means “sack”. Embedded in the thylakoid membranes are important protein complexes which carry out the light reactions of photosynthesis. Photosystem II and photosystem I contain light-harvesting complexes with chlorophyll and carotenoids that absorb light energy and use it to energize electrons. Molecules in the thylakoid membrane use the energized electrons to pump hydrogen ions into the thylakoid space, decreasing the pH and turning it acidic. ATP synthase is a large protein complex that harnesses the concentration gradient of the hydrogen ions in the thylakoid space to generate ATP energy as the hydrogen ions flow back out into the stroma—much like a dam turbine. There are two types of thylakoids—granal thylakoids, which are arranged in grana, and stromal thylakoids, which are in contact with the stroma. Granal thylakoids are pancake-shaped circular disks about 300–600 nanometers in diameter. Stromal thylakoids are helicoid sheets that spiral around grana. The flat tops and bottoms of granal thylakoids contain only the relatively flat photosystem II protein complex. This allows them to stack tightly, forming grana with many layers of tightly appressed membrane, called granal membrane, increasing stability and surface area for light capture. In contrast, photosystem I and ATP synthase are large protein complexes which jut out into the stroma. They can’t fit in the appressed granal membranes, and so are found in the stromal thylakoid membrane—the edges of the granal thylakoid disks and the stromal thylakoids. These large protein complexes may act as spacers between the sheets of stromal thylakoids. The number of thylakoids and the total thylakoid area of a chloroplast is influenced by light exposure. Shaded chloroplasts contain larger and more grana with more thylakoid membrane area than chloroplasts exposed to bright light, which have smaller and fewer grana and less thylakoid area. Thylakoid extent can change within minutes of light exposure or removal. Inside the photosystems embedded in chloroplast thylakoid membranes are various photosynthetic pigments, which absorb and transfer light energy. The types of pigments found are different in various groups of chloroplasts, and are responsible for a wide variety of chloroplast colorations. Paper chroma-tography of some spinach leaf extract shows the various pigments present in their chloroplasts. Chlorophyll a is found in all chloroplasts, as well as their cyanobacterial ancestors. Chlorophyll a is a blue-green pigment partially responsible for giving most cyanobacteria and chloroplasts their color. Other forms of chlorophyll exist, such as the accessory pigments chlorophyll b, chlorophyll c, chlorophyll d, and chlorophyll f.
Chlorophyll b is an olive green pigment found only in the chloroplasts of plants, green algae, any secondary chloroplasts obtained through the secondary endosymbiosis of a green alga, and a few cyanobacteria. It is the chlorophylls a and b together that make most plant and green algal chloroplasts green. Chlorophyll c is mainly found in secondary endosymbiotic chloroplasts that originated from a red alga, although it is not found in chloroplasts of red algae themselves. Chlorophyll c is also found in some green algae and cyanobacteria. Chlorophylls d and f are pigments found only in some cyanobacteria. Delesseria sanguinea, a red alga, has chloroplasts that contain red pigments like phycoerytherin that mask their blue-green chlorophyll a. In addition to chlorophylls, another group of yellow–orange pigments called carotenoids are also found in the photosystems. There are about thirty photosynthetic carotenoids. They help transfer and dissipate excess energy, and their bright colors sometimes override the chlorophyll green, like during the fall, when the leaves of some land plants change color. β-carotene is a bright red-orange carotenoid found in nearly all chloroplasts, like chlorophyll a. Xanthophylls, especially the orange-red zeaxanthin, are also common. Many other forms of carotenoids exist that are only found in certain groups of chloroplasts. Phycobilins are a third group of pigments found in cyanobacteria, and glaucophyte, red algal, and cryptophyte chloroplasts. Phycobilins come in all colors, though phycoerytherin is one of the pigments that makes many red algae red. Phycobilins often organize into relatively large protein complexes about 40 nanometers across called phycobilisomes. Like photosystem I and ATP synthase, phycobilisomes jut into the stroma, preventing thylakoid stacking in red algal chloroplasts. Cryptophyte chloroplasts and some cyanobacteria don’t have their phycobilin pigments organized into phycobilisomes, and keep them in their thylakoid space instead. Photosynthetic pigments Table of the presence of various pigments across chloroplast groups. Colored cells represent pigment presence. Many C4 plants have their mesophyll cells and bundle sheath cells arranged radially around their leaf veins. The two types of cells contain different types of chloroplasts specialized for a particular part of photosynthesis. 2 being released, all with no sugar being produced. This is a big problem, since O2 is produced by the initial light reactions of photosynthesis, causing issues down the line in the Calvin cycle which uses RuBisCO. C4 plants evolved a way to solve this—by spatially separating the light reactions and the Calvin cycle. The light reactions, which store light energy in ATP and NADPH, are done in the mesophyll cells of a C4 leaf. The Calvin cycle, which uses the stored energy to make sugar using RuBisCO, is done in the bundle sheath cells, a layer of cells surrounding a vein in a leaf. 2 and returns to the mesophyll. Bundle sheath chloroplasts do not carry out the light reactions, preventing oxygen from building up in them and disrupting RuBisCO activity. Because of this, they lack thylakoids organized into grana stacks—though bundle sheath chloroplasts still have free-floating thylakoids in the stroma where they still carry out cyclic electron flow, a light-driven method of synthesizing ATP to power the Calvin cycle without generating oxygen. They lack photosystem II, and only have photosystem I—the only protein complex needed for cyclic electron flow. Because the job of bundle sheath chloroplasts is to carry out the Calvin cycle and make sugar, they often contain large starch grains. Both types of chloroplast contain large amounts of chloroplast peripheral reticulum, which they use to get more surface area to transport stuff in and out of them. Mesophyll chloroplasts have a little more peripheral reticulum than bundle sheath chloroplasts. Not all cells in a multicellular plant contain chloroplasts. All green parts of a plant contain chloroplasts—the chloroplasts, or more specifically, the chlorophyll in them are what make the photosynthetic parts of a plant green. The plant cells which contain chloroplasts are usually parenchyma cells, though chloroplasts can also be found in collenchyma tissue. A plant cell which contains chloroplasts is known as a chlorenchyma cell. A typical chlorenchyma cell of a land plant contains about 10 to 100 chloroplasts. A cross section of a leaf, showing chloroplasts in its mesophyll cells. Stomal guard cells also have chloroplasts, though much fewer than mesophyll cells. In some plants such as cacti, chloroplasts are found in the stems, though in most plants, chloroplasts are concentrated in the leaves. One square millimeter of leaf tissue can contain half a million chloroplasts. Within a leaf, chloroplasts are mainly found in the mesophyll layers of a leaf, and the guard cells of stomata. Palisade mesophyll cells can contain 30–70 chloroplasts per cell, while stomatal guard cells contain only around 8–15 per cell, as well as much less chlorophyll. Chloroplasts can also be found in the bundle sheath cells of a leaf, especially in C4 plants, which carry out the Calvin cycle in their bundle sheath cells. They are often absent from the epidermis of a leaf. When chloroplasts are exposed to direct sunlight, they stack along the anticlinal cell walls to minimize exposure. In the dark they spread out in sheets along the periclinal walls to maximize light absorption. The chloroplasts of plant and algal cells can orient themselves to best suit the available light. In low-light conditions, they will spread out in a sheet—maximizing the surface area to absorb light. Under intense light, they will seek shelter by aligning in vertical columns along the plant cell’s cell wall or turning sideways so that light strikes them edge-on. This reduces exposure and protects them from photooxidative damage. This ability to distribute chloroplasts so that they can take shelter behind each other or spread out may be the reason why land plants evolved to have many small chloroplasts instead of a few big ones. Chloroplast movement is considered one of the most closely regulated stimulus-response systems that can be found in plants. Mitochondria have also been observed to follow chloroplasts as they move. In higher plants, chloroplast movement is run by phototropins, blue light photoreceptors also responsible for plant phototropism. In some algae, mosses, ferns, and flowering plants, chloroplast movement is influenced by red light in addition to blue light, though very long red wavelengths inhibit movement rather than speeding it up. Blue light generally causes chloroplasts to seek shelter, while red light draws them out to maximize light absorption. Studies of Vallisneria gigantea, an aquatic flowering plant, have shown that chloroplasts can get moving within five minutes of light exposure, though they don’t initially show any net directionality. They may move along microfilament tracks, and the fact that the microfilament mesh changes shape to form a honeycomb structure surrounding the chloroplasts after they have moved suggests that microfilaments may help to anchor chloroplasts in place. Unlike most epidermal cells, the guard cells of plant stomata contain relatively well-developed chloroplasts. However, exactly what they do is controversial. Plants lack specialized immune cells—all plant cells participate in the plant immune response. Chloroplasts, along with the nucleus, cell membrane, and endoplasmic reticulum, are key players in pathogen defense. Due to its role in a plant cell’s immune response, pathogens frequently target the chloroplast. Plants have two main immune responses—the hypersensitive response, in which infected cells seal themselves off and undergo programmed cell death, and systemic acquired resistance, where infected cells release signals warning the rest of the plant of a pathogen’s presence. Chloroplasts stimulate both responses by purposely damaging their photosynthetic system, producing reactive oxygen species. High levels of reactive oxygen species will cause the hypersensitive response. The reactive oxygen species also directly kill any pathogens within the cell. Lower levels of reactive oxygen species initiate systemic acquired resistance, triggering defense-molecule production in the rest of the plant. In some plants, chloroplasts are known to move closer to the infection site and the nucleus during an infection. Chloroplasts can serve as cellular sensors. After detecting stress in a cell, which might be due to a pathogen, chloroplasts begin producing molecules like salicylic acid, jasmonic acid, nitric oxide and reactive oxygen species which can serve as defense-signals. As cellular signals, reactive oxygen species are unstable molecules, so they probably don’t leave the chloroplast, but instead pass on their signal to an unknown second messenger molecule. All these molecules initiate retrograde signaling—signals from the chloroplast that regulate gene expression in the nucleus. In addition to defense signaling, chloroplasts, with the help of the peroxisomes, help synthesize an important defense molecule, jasmonate. Chloroplasts synthesize all the fatty acids in a plant cell—linoleic acid, a fatty acid, is a precursor to jasmonate. One of the main functions of the chloroplast is its role in photosynthesis, the process by which light is transformed into chemical energy, to subsequently produce food in the form of sugars. Water (H2O) and carbon dioxide (CO2) are used in photosynthesis, and sugar and oxygen (O2) is made, using light energy. Photosynthesis is divided into two stages—the light reactions, where water is split to produce oxygen, and the dark reactions, or Calvin cycle, which builds sugar molecules from carbon dioxide. The two phases are linked by the energy carriers adenosine triphosphate (ATP) and nicotinamide adenine dinucleotide phosphate (NADP+). The light reactions of photosynthesis take place across the thylakoid membranes. The light reactions take place on the thylakoid membranes. They take light energy and store it in NADPH, a form of NADP+, and ATP to fuel the dark reactions. ATP is the phosphorylated version of adenosine diphosphate (ADP), which stores energy in a cell and powers most cellular activities. ATP is the energized form, while ADP is the (partially) depleted form. NADP+ is an electron carrier which ferries high energy electrons. In the light reactions, it gets reduced, meaning it picks up electrons, becoming NADPH. Like mitochondria, chloroplasts use the potential energy stored in an H+, or hydrogen ion gradient to generate ATP energy. The two photosystems capture light energy to energize electrons taken from water, and release them down an electron transport chain. The molecules between the photosystems harness the electrons’ energy to pump hydrogen ions into the thylakoid space, creating a concentration gradient, with more hydrogen ions (up to a thousand times as many) inside the thylakoid system than in the stroma. The hydrogen ions in the thylakoid space then diffuse back down their concentration gradient, flowing back out into the stroma through ATP synthase. ATP synthase uses the energy from the flowing hydrogen ions to phosphorylate adenosine diphosphate into adenosine triphosphate, or ATP. Because chloroplast ATP synthase projects out into the stroma, the ATP is synthesized there, in position to be used in the dark reactions. Electrons are often removed from the electron transport chains to charge NADP+ with electrons, reducing it to NADPH. Like ATP synthase, ferredoxin-NADP+ reductase, the enzyme that reduces NADP+, releases the NADPH it makes into the stroma, right where it is needed for the dark reactions. Because NADP+ reduction removes electrons from the electron transport chains, they must be replaced—the job of photosystem II, which splits water molecules (H2O) to obtain the electrons from its hydrogen atoms. While photosystem II photolyzes water to obtain and energize new electrons, photosystem I simply reenergizes depleted electrons at the end of an electron transport chain. Normally, the reenergized electrons are taken by NADP+, though sometimes they can flow back down more H+-pumping electron transport chains to transport more hydrogen ions into the thylakoid space to generate more ATP. This is termed cyclic photophosphorylation because the electrons are recycled. Cyclic photophosphorylation is common in C4 plants, which need more ATP than NADPH. The Calvin cycle, also known as the dark reactions, is a series of biochemical reactions that fixes CO2 into G3P sugar molecules and uses the energy and electrons from the ATP and NADPH made in the light reactions. The Calvin cycle takes place in the stroma of the chloroplast. While named “the dark reactions”, in most plants, they take place in the light, since the dark reactions are dependent on the products of the light reactions. 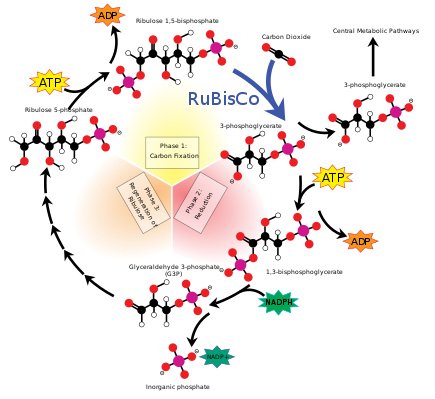 The Calvin cycle starts by using the enzyme RuBisCO to fix CO2 into five-carbon Ribulose bisphosphate (RuBP) molecules. The result is unstable six-carbon molecules that immediately break down into three-carbon molecules called 3-phosphoglyceric acid, or 3-PGA. The ATP and NADPH made in the light reactions is used to convert the 3-PGA into glyceraldehyde-3-phosphate, or G3P sugar molecules. Most of the G3P molecules are recycled back into RuBP using energy from more ATP, but one out of every six produced leaves the cycle—the end product of the dark reactions. Glyceraldehyde-3-phosphate can double up to form larger sugar molecules like glucose and fructose. These molecules are processed, and from them, the still larger sucrose, a disaccharide commonly known as table sugar, is made, though this process takes place outside of the chloroplast, in the cytoplasm. Sucrose is made up of a glucose monomer (left), and a fructose monomer (right). Alternatively, glucose monomers in the chloroplast can be linked together to make starch, which accumulates into the starch grains found in the chloroplast. Under conditions such as high atmospheric CO2 concentrations, these starch grains may grow very large, distorting the grana and thylakoids. The starch granules displace the thylakoids, but leave them intact. Waterlogged roots can also cause starch buildup in the chloroplasts, possibly due to less sucrose being exported out of the chloroplast (or more accurately, the plant cell). This depletes a plant’s free phosphate supply, which indirectly stimulates chloroplast starch synthesis. While linked to low photosynthesis rates, the starch grains themselves may not necessarily interfere significantly with the efficiency of photosynthesis, and might simply be a side effect of another photosynthesis-depressing factor. Photorespiration can occur when the oxygen concentration is too high. RuBisCO cannot distinguish between oxygen and carbon dioxide very well, so it can accidentally add O2 instead of CO2 to RuBP. This process reduces the efficiency of photosynthesis—it consumes ATP and oxygen, releases CO2, and produces no sugar. It can waste up to half the carbon fixed by the Calvin cycle. Several mechanisms have evolved in different lineages that raise the carbon dioxide concentration relative to oxygen within the chloroplast, increasing the efficiency of photosynthesis. These mechanisms are called carbon dioxide concentrating mechanisms, or CCMs. These include Crassulacean acid metabolism, C4 carbon fixation, and pyrenoids. Chloroplasts in C4 plants are notable as they exhibit a distinct chloroplast dimorphism. Because of the H+ gradient across the thylakoid membrane, the interior of the thylakoid is acidic, with a pH around 4, while the stroma is slightly basic, with a pH of around 8. The optimal stroma pH for the Calvin cycle is 8.1, with the reaction nearly stopping when the pH falls below 7.3. CO2 in water can form carbonic acid, which can disturb the pH of isolated chloroplasts, interfering with photosynthesis, even though CO2 is used in photosynthesis. However, chloroplasts in living plant cells are not affected by this as much. Chloroplasts can pump K+ and H+ ions in and out of themselves using a poorly understood light-driven transport system. In the presence of light, the pH of the thylakoid lumen can drop up to 1.5 pH units, while the pH of the stroma can rise by nearly one pH unit. Chloroplasts alone make almost all of a plant cell’s amino acids in their stroma except the sulfur-containing ones like cysteine and methionine. Cysteine is made in the chloroplast (the proplastid too) but it is also synthesized in the cytosol and mitochondria, probably because it has trouble crossing membranes to get to where it is needed. The chloroplast is known to make the precursors to methionine but it is unclear whether the organelle carries out the last leg of the pathway or if it happens in the cytosol. Chloroplasts make all of a cell’s purines and pyrimidines—the nitrogenous bases found in DNA and RNA. They also convert nitrite (NO2−) into ammonia (NH3) which supplies the plant with nitrogen to make its amino acids and nucleotides. The plastid is the site of diverse and complex lipid synthesis in plants. The carbon used to form the majority of the lipid is from acetyl-CoA, which is the decarboxylation product of pyruvate. Pyruvate may enter the plastid from the cytosol by passive diffusion through the membrane after production in glycolysis. Pyruvate is also made in the plastid from phosphoenolpyruvate, a metabolite made in the cytosol from pyruvate or PGA. Acetate in the cytosol is unavailable for lipid biosynthesis in the plastid. The typical length of fatty acids produced in the plastid are 16 or 18 carbons, with 0-3 cis double bonds. The biosynthesis of fatty acids from acetyl-CoA primarily requires two enzymes. Acetyl-CoA carboxylase creates malonyl-CoA, used in both the first step and the extension steps of synthesis. Fatty acid synthase (FAS) is a large complex of enzymes and cofactors including acyl carrier protein (ACP) which holds the acyl chain as it is synthesized. The initiation of synthesis begins with the condensation of malonyl-ACP with acetyl-CoA to produce ketobutyryl-ACP. 2 reductions involving the use of NADPH and one dehydration creates butyryl-ACP. Extension of the fatty acid comes from repeated cycles of malonyl-ACP condensation, reduction, and dehydration. Other lipids are derived from the methyl-erythritol phosphate (MEP) pathway and consist of gibberelins, sterols, abscisic acid, phytol, and innumerable secondary metabolites. Plastid types (Interactive diagram) Plants contain many different kinds of plastids in their cells. Chloroplasts are a special type of a plant cell organelle called a plastid, though the two terms are sometimes used interchangeably. There are many other types of plastids, which carry out various functions. All chloroplasts in a plant are descended from undifferentiated proplastids found in the zygote, or fertilized egg. Proplastids are commonly found in an adult plant’s apical meristems. Chloroplasts do not normally develop from proplastids in root tip meristems—instead, the formation of starch-storing amyloplasts is more common. In shoots, proplastids from shoot apical meristems can gradually develop into chloroplasts in photosynthetic leaf tissues as the leaf matures, if exposed to the required light. This process involves invaginations of the inner plastid membrane, forming sheets of membrane that project into the internal stroma. These membrane sheets then fold to form thylakoids and grana. If angiosperm shoots are not exposed to the required light for chloroplast formation, proplastids may develop into an etioplast stage before becoming chloroplasts. An etioplast is a plastid that lacks chlorophyll, and has inner membrane invaginations that form a lattice of tubes in their stroma, called a prolamellar body. While etioplasts lack chlorophyll, they have a yellow chlorophyll precursor stocked. Within a few minutes of light exposure, the prolamellar body begins to reorganize into stacks of thylakoids, and chlorophyll starts to be produced. This process, where the etioplast becomes a chloroplast, takes several hours. Gymnosperms do not require light to form chloroplasts. Light, however, does not guarantee that a proplastid will develop into a chloroplast. Whether a proplastid develops into a chloroplast some other kind of plastid is mostly controlled by the nucleus and is largely influenced by the kind of cell it resides in. Many plastid interconversions are possible. Plastid differentiation is not permanent, in fact many interconversions are possible. Chloroplasts may be converted to chromoplasts, which are pigment-filled plastids responsible for the bright colors seen in flowers and ripe fruit. Starch storing amyloplasts can also be converted to chromoplasts, and it is possible for proplastids to develop straight into chromoplasts. Chromoplasts and amyloplasts can also become chloroplasts, like what happens when a carrot or a potato is illuminated. If a plant is injured, or something else causes a plant cell to revert to a meristematic state, chloroplasts and other plastids can turn back into proplastids. Chloroplast, amyloplast, chromoplast, proplast, etc., are not absolute states—intermediate forms are common. Most chloroplasts in a photosynthetic cell do not develop directly from proplastids or etioplasts. In fact, a typical shoot meristematic plant cell contains only 7–20 proplastids. These proplastids differentiate into chloroplasts, which divide to create the 30–70 chloroplasts found in a mature photosynthetic plant cell. If the cell divides, chloroplast division provides the additional chloroplasts to partition between the two daughter cells. In single-celled algae, chloroplast division is the only way new chloroplasts are formed. There is no proplastid differentiation—when an algal cell divides, its chloroplast divides along with it, and each daughter cell receives a mature chloroplast. Almost all chloroplasts in a cell divide, rather than a small group of rapidly dividing chloroplasts. Chloroplasts have no definite S-phase—their DNA replication is not synchronized or limited to that of their host cells. Much of what we know about chloroplast division comes from studying organisms like Arabidopsis and the red alga Cyanidioschyzon merolæ. The division process starts when the proteins FtsZ1 and FtsZ2 assemble into filaments, and with the help of a protein ARC6, form a structure called a Z-ring within the chloroplast’s stroma. The Min system manages the placement of the Z-ring, ensuring that the chloroplast is cleaved more or less evenly. The protein MinD prevents FtsZ from linking up and forming filaments. Another protein ARC3 may also be involved, but it is not very well understood. These proteins are active at the poles of the chloroplast, preventing Z-ring formation there, but near the center of the chloroplast, MinE inhibits them, allowing the Z-ring to form. Next, the two plastid-dividing rings, or PD rings form. The inner plastid-dividing ring is located in the inner side of the chloroplast’s inner membrane, and is formed first. The outer plastid-dividing ring is found wrapped around the outer chloroplast membrane. It consists of filaments about 5 nanometers across, arranged in rows 6.4 nanometers apart, and shrinks to squeeze the chloroplast. This is when chloroplast constriction begins. In a few species like Cyanidioschyzon merolæ, chloroplasts have a third plastid-dividing ring located in the chloroplast’s intermembrane space. Late into the constriction phase, dynamin proteins assemble around the outer plastid-dividing ring, helping provide force to squeeze the chloroplast. Meanwhile, the Z-ring and the inner plastid-dividing ring break down. During this stage, the many chloroplast DNA plasmids floating around in the stroma are partitioned and distributed to the two forming daughter chloroplasts. Later, the dynamins migrate under the outer plastid dividing ring, into direct contact with the chloroplast’s outer membrane, to cleave the chloroplast in two daughter chloroplasts. A remnant of the outer plastid dividing ring remains floating between the two daughter chloroplasts, and a remnant of the dynamin ring remains attached to one of the daughter chloroplasts. Of the five or six rings involved in chloroplast division, only the outer plastid-dividing ring is present for the entire constriction and division phase—while the Z-ring forms first, constriction does not begin until the outer plastid-dividing ring forms. Chloroplast division In this light micrograph of some moss chloroplasts, many dumbbell-shaped chloroplasts can be seen dividing. Grana are also just barely visible as small granules. In species of algae that contain a single chloroplast, regulation of chloroplast division is extremely important to ensure that each daughter cell receives a chloroplast—chloroplasts can’t be made from scratch. In organisms like plants, whose cells contain multiple chloroplasts, coordination is looser and less important. It is likely that chloroplast and cell division are somewhat synchronized, though the mechanisms for it are mostly unknown. Light has been shown to be a requirement for chloroplast division. Chloroplasts can grow and progress through some of the constriction stages under poor quality green light, but are slow to complete division—they require exposure to bright white light to complete division. Spinach leaves grown under green light have been observed to contain many large dumbbell-shaped chloroplasts. Exposure to white light can stimulate these chloroplasts to divide and reduce the population of dumbbell-shaped chloroplasts. Like mitochondria, chloroplasts are usually inherited from a single parent. Biparental chloroplast inheritance—where plastid genes are inherited from both parent plants—occurs in very low levels in some flowering plants. Many mechanisms prevent biparental chloroplast DNA inheritance, including selective destruction of chloroplasts or their genes within the gamete or zygote, and chloroplasts from one parent being excluded from the embryo. Parental chloroplasts can be sorted so that only one type is present in each offspring. Gymnosperms, such as pine trees, mostly pass on chloroplasts paternally, while flowering plants often inherit chloroplasts maternally. Flowering plants were once thought to only inherit chloroplasts maternally. However, there are now many documented cases of angiosperms inheriting chloroplasts paternally. Angiosperms, which pass on chloroplasts maternally, have many ways to prevent paternal inheritance. Most of them produce sperm cells that do not contain any plastids. There are many other documented mechanisms that prevent paternal inheritance in these flowering plants, such as different rates of chloroplast replication within the embryo. Among angiosperms, paternal chloroplast inheritance is observed more often in hybrids than in offspring from parents of the same species. This suggests that incompatible hybrid genes might interfere with the mechanisms that prevent paternal inheritance. Recently, chloroplasts have caught attention by developers of genetically modified crops. Since, in most flowering plants, chloroplasts are not inherited from the male parent, transgenes in these plastids cannot be disseminated by pollen. This makes plastid transformation a valuable tool for the creation and cultivation of genetically modified plants that are biologically contained, thus posing significantly lower environmental risks. This biological containment strategy is therefore suitable for establishing the coexistence of conventional and organic agriculture. While the reliability of this mechanism has not yet been studied for all relevant crop species, recent results in tobacco plants are promising, showing a failed containment rate of transplastomic plants at 3 in 1,000,000. ^ “chloroplast”. Online Etymology Dictionary. ^ von Mohl, H. (1835/1837). Ueber die Vermehrung der Pflanzen-Zellen durch Teilung. Dissert. Tubingen 1835. Flora 1837, . ^ a b Schimper, A.F.W. (1883). “Über die Entwicklung der Chlorophyllkörner und Farbkörper” [About the development of the chlorophyll grains and stains]. Bot. Zeitung (in German). 41: 105–14, 121–31, 137–46, 153–62. Archived from the original on 19 October 2013. ^ Gunning, B., Koenig, F. & Govindjee, P. (2006). A dedication to pioneers of research on chloroplast structure. In: R. R. Wise & J. K. Hoober (ed.). The structure and function of plastids. Springer: Netherlands, pp. xxiii–xxxi. ^ Hoober, J. K. (1984). Chloroplasts. Plenum: New York. ^ a b c d e f g h i j Biology 8th Edition Campbell & Reece. Benjamin Cummings (Pearson). 2009. p. 516. ^ Mereschkowsky C (1905). “Über Natur und Ursprung der Chromatophoren im Pflanzenreiche” [About the nature and origin of chromatophores in the vegetable kingdom]. Biol Centralbl (in German). 25: 593–604. ^ a b c d Alberts, Bruce (2002). Molecular biology of the cell (4. ed.). New York [u.a. ]: Garland. ISBN 0-8153-4072-9. ^ a b Kumar, K.; Mella-Herrera, R. A.; Golden, J. W. (2010). “Cyanobacterial Heterocysts”. Cold Spring Harbor Perspectives in Biology. 2 (4): a000315. doi:10.1101/cshperspect.a000315. PMC 2845205. PMID 20452939. ^ a b c d e f Biology 8th edition—Campbell&Reece. Benjamin Cummings. 2008. pp. 186–187. ISBN 978-0-321-54325-7. ^ a b c d e f g h i j k l m n o p q r s t u v w x y z aa ab ac ad ae af ag ah ai aj ak al am an ao ap aq ar as at au av aw Kim, E.; Archibald, J. M. (2009). “Diversity and Evolution of Plastids and Their Genomes”. In Sandelius, Anna Stina; Aronsson, Henrik. The Chloroplast. Plant Cell Monographs. 13. pp. 1–39. doi:10.1007/978-3-540-68696-5_1. ISBN 978-3-540-68692-7. ^ Bryant, Donald A.; Guglielmi, Gérard; Marsac, Nicole Tandeau; Castets, Anne-Marie; Cohen-Bazire, Germaine (1979). “The structure of cyanobacterial phycobilisomes: A model”. Archives of Microbiology. 123 (2): 311–34. doi:10.1007/BF00446810. ^ a b c d e f g h i j k l m n o p q r s t u v w x y z aa ab ac ad ae af Keeling, Patrick J. (2004). “Diversity and evolutionary history of plastids and their hosts”. American Journal of Botany. 91 (10): 1481–93. doi:10.3732/ajb.91.10.1481. PMID 21652304. ^ a b c d McFadden, Geoffrey I; Van Dooren, Giel G (2004). “Evolution: Red Algal Genome Affirms a Common Origin of All Plastids”. Current Biology. 14 (13): R514–6. doi:10.1016/j.cub.2004.06.041. PMID 15242632. ^ a b c d e Milo, Ron; Philips, Rob. “Cell Biology by the Numbers: How large are chloroplasts?”. book.bionumbers.org. Retrieved 7 February 2017. Sánchez-Baracaldo, Patricia; Raven, John A.; Pisani, Davide; Knoll, Andrew H. (2017-09-12). “Early photosynthetic eukaryotes inhabited low-salinity habitats”. Proceedings of the National Academy of Sciences. 114 (37): E7737–E7745. doi:10.1073/pnas.1620089114. ^ Fuks, Bruno; Fabrice Homblé (8 July 1996). “Mechanism of Proton Permeation through Chloroplast Lipid Membranes” (PDF). Plant Physiology. 112 (2): 759–766. doi:10.1104/pp.112.2.759. PMC 158000. PMID 8883387. Retrieved 25 August 2013. ^ Joyard J Block MA, Douce R; Block; Douce (1991). “Molecular aspects of plastid envelope biochemistry”. Eur. J. Biochem. 199 (3): 489–509. doi:10.1111/j.1432-1033.1991.tb16148.x. PMID 1868841. ^ “Chloroplast”. Encyclopedia of Science. Retrieved 27 December 2012. ^ a b c d e f Nakayama, Takuro; Archibald, John M (2012). “Evolving a photosynthetic organelle”. BMC Biology. 10 (1): 35. doi:10.1186/1741-7007-10-35. PMC 3337241. PMID 22531210. ^ a b c d e McFadden, G. I. (2001). “Chloroplast Origin and Integration”. Plant Physiology. 125 (1): 50–3. doi:10.1104/pp.125.1.50. PMC 1539323. PMID 11154294. ^ Archibald, John M. (2009). “The Puzzle of Plastid Evolution”. Current Biology. 19 (2): R81–8. doi:10.1016/j.cub.2008.11.067. PMID 19174147. ^ Ponce-Toledo, Rafael I.; Deschamps, Philippe; López-García, Purificación; Zivanovic, Yvan; Benzerara, Karim; Moreira, David (2017). “An Early-Branching Freshwater Cyanobacterium at the Origin of Plastids”. Current Biology. 27 (3): 386–391. doi:10.1016/j.cub.2016.11.056. ^ de Vries, Jan; Archibald, John M. (2017). “Endosymbiosis: Did Plastids Evolve from a Freshwater Cyanobacterium?”. Current Biology. 27 (3): R103–R105. doi:10.1016/j.cub.2016.12.006. ^ a b López-García, Purificación; Eme, Laura; Moreira, David (2017). “Symbiosis in eukaryotic evolution”. Journal of Theoretical Biology. 434: 20–33. doi:10.1016/j.jtbi.2017.02.031. ^ Delaye, Luis; Valadez-Cano, Cecilio; Pérez-Zamorano, Bernardo (2016). “How Really Ancient Is Paulinella Chromatophora?”. PLoS Currents. doi:10.1371/currents.tol.e68a099364bb1a1e129a17b4e06b0c6b. ^ Ball, S.; Colleoni, C.; Cenci, U.; Raj, J. N.; Tirtiaux, C. (2011). “The evolution of glycogen and starch metabolism in eukaryotes gives molecular clues to understand the establishment of plastid endosymbiosis”. Journal of Experimental Botany. 62 (6): 1775–801. doi:10.1093/jxb/erq411. PMID 21220783. ^ a b c d e f g h i j k l m n o p q r s t u v w x y z aa ab ac ad ae af Keeling, P. J. (2010). “The endosymbiotic origin, diversification and fate of plastids”. Philosophical Transactions of the Royal Society B: Biological Sciences. 365 (1541): 729–48. doi:10.1098/rstb.2009.0103. PMC 2817223. PMID 20124341. ^ a b c d e f g Biology 8th Edition Campbell & Reece. Benjamin Cummings (Pearson). 2009. pp. 582–92. ^ “rhodo-“. The Free Dictionary. Farlex. Retrieved 2013-06-07. ^ a b Lewis, L. A.; McCourt, R. M. (2004). “Green algae and the origin of land plants”. American Journal of Botany. 91 (10): 1535–56. doi:10.3732/ajb.91.10.1535. PMID 21652308. ^ Machida, M.; Takechi, K; Sato, H; Chung, SJ; Kuroiwa, H; Takio, S; Seki, M; Shinozaki, K; Fujita, T; Hasebe, M; Takano, H (2006). “Genes for the peptidoglycan synthesis pathway are essential for chloroplast division in moss”. Proceedings of the National Academy of Sciences. 103 (17): 6753–8. Bibcode:2006PNAS..103.6753M. doi:10.1073/pnas.0510693103. PMC 1458953. PMID 16618924. ^ Moroney, J. V.; Somanchi, A (1999). “How Do Algae Concentrate CO2 to Increase the Efficiency of Photosynthetic Carbon Fixation?”. Plant Physiology. 119 (1): 9–16. doi:10.1104/pp.119.1.9. PMC 1539202. PMID 9880340. ^ Tartar, AuréLien; Boucias, Drion G. (2004). “The non-photosynthetic, pathogenic green alga Helicosporidium sp. Has retained a modified, functional plastid genome”. FEMS Microbiology Letters. 233 (1): 153–7. doi:10.1016/j.femsle.2004.02.006. PMID 15043882. ^ a b c d Nowack, E. C. M.; Vogel, H.; Groth, M.; Grossman, A. R.; Melkonian, M.; Glöckner, G. (2010). “Endosymbiotic Gene Transfer and Transcriptional Regulation of Transferred Genes in Paulinella chromatophora“. Molecular Biology and Evolution. 28 (1): 407–22. doi:10.1093/molbev/msq209. PMID 20702568. ^ a b c d e Dann, Leighton (2002). Bioscience—Explained (PDF). Green DNA: BIOSCIENCE EXPLAINED. ^ a b c d e Clegg, M. T.; Gaut, BS; Learn Jr, GH; Morton, BR (1994). “Rates and Patterns of Chloroplast DNA Evolution”. Proceedings of the National Academy of Sciences. 91 (15): 6795–801. Bibcode:1994PNAS…91.6795C. doi:10.1073/pnas.91.15.6795. PMC 44285. PMID 8041699. ^ a b c d e f Shaw, J.; Lickey, E. B.; Schilling, E. E.; Small, R. L. (2007). “Comparison of whole chloroplast genome sequences to choose noncoding regions for phylogenetic studies in angiosperms: The tortoise and the hare III”. American Journal of Botany. 94 (3): 275–88. doi:10.3732/ajb.94.3.275. PMID 21636401. ^ a b Chaal, Balbir K.; Green, Beverley R. (February 2005). “Protein import pathways in ‘complex’ chloroplasts derived from secondary endosymbiosis involving a red algal ancestor”. Plant Molecular Biology. 57 (3): 333–42. doi:10.1007/s11103-004-7848-y. PMID 15830125. ^ a b Moustafa, Ahmed; Beszteri, Bánk; Maier, Uwe G.; Bowler, Chris; Valentin, Klaus; Bhattacharya, Debashish (2009). “Genomic Footprints of a Cryptic Plastid Endosymbiosis in Diatoms”. Science. 324 (5935): 1724–6. Bibcode:2009Sci…324.1724M. doi:10.1126/science.1172983. PMID 19556510. ^ Rogers, M. B.; Gilson, P. R.; Su, V.; McFadden, G. I.; Keeling, P. J. (2006). “The Complete Chloroplast Genome of the Chlorarachniophyte Bigelowiella natans: Evidence for Independent Origins of Chlorarachniophyte and Euglenid Secondary Endosymbionts”. Molecular Biology and Evolution. 24 (1): 54–62. doi:10.1093/molbev/msl129. PMID 16990439. ^ a b c d e f g h i j k l m n Hackett, J. D.; Anderson, D. M.; Erdner, D. L.; Bhattacharya, D. (2004). “Dinoflagellates: A remarkable evolutionary experiment”. American Journal of Botany. 91 (10): 1523–34. doi:10.3732/ajb.91.10.1523. PMID 21652307. ^ Toledo, Rafael Isaac Ponce (2018-03-05). Origins and early evolution of photosynthetic eukaryotes (Thesis). Université Paris-Saclay. ^ Bodył, Andrzej (2017-05-23). “Did some red alga-derived plastids evolve via kleptoplastidy? A hypothesis”. Biological Reviews. 93 (1): 201–222. doi:10.1111/brv.12340. ISSN 1464-7931. ^ a b Janouškovec, Jan; Gavelis, Gregory S.; Burki, Fabien; Dinh, Donna; Bachvaroff, Tsvetan R.; Gornik, Sebastian G.; Bright, Kelley J.; Imanian, Behzad; Strom, Suzanne L. (2017-01-10). “Major transitions in dinoflagellate evolution unveiled by phylotranscriptomics”. Proceedings of the National Academy of Sciences. 114 (2): E171–E180. doi:10.1073/pnas.1614842114. ISSN 0027-8424. PMC 5240707. PMID 28028238. ^ a b c d Nair, Sethu C.; Striepen, Boris (2011). “What Do Human Parasites Do with a Chloroplast Anyway?”. PLoS Biology. 9 (8): e1001137. doi:10.1371/journal.pbio.1001137. PMC 3166169. PMID 21912515. ^ Quigg, Antonietta; Kotabová, Eva; Jarešová, Jana; Kaňa, Radek; Šetlík, Jiří; Šedivá, Barbora; Komárek, Ondřej; Prášil, Ondřej (2012-10-10). “Photosynthesis in Chromera velia Represents a Simple System with High Efficiency”. PLOS ONE. 7 (10): e47036. Bibcode:2012PLoSO…747036Q. doi:10.1371/journal.pone.0047036. ISSN 1932-6203. ^ Dorrell, R. G.; Smith, A. G. (2011). “Do Red and Green Make Brown? : Perspectives on Plastid Acquisitions within Chromalveolates”. Eukaryotic Cell. 10 (7): 856–68. doi:10.1128/EC.00326-10. PMC 3147421. PMID 21622904. ^ Meeson, B. W.; Chang, S. S.; Sweeney, B. M. (1982). “Characterization of Peridinin-Chlorophyll α-Proteins from the Marine Dinoflagellate Ceratium furca”. Botanica Marina. 25 (8): 347–50. doi:10.1515/botm.1982.25.8.347. ^ a b c Tengs, T; Dahlberg, OJ; Shalchian-Tabrizi, K; Klaveness, D; Rudi, K; Delwiche, CF; Jakobsen, KS (2000). “Phylogenetic analyses indicate that the 19’Hexanoyloxy-fucoxanthin-containing dinoflagellates have tertiary plastids of haptophyte origin”. Molecular Biology and Evolution. 17 (5): 718–29. doi:10.1093/oxfordjournals.molbev.a026350. PMID 10779532. ^ a b c Schnepf, Eberhard; Elbrächter, Malte (1999). “Dinophyte chloroplasts and phylogeny – A review”. Grana. 38 (2–3): 81–97. doi:10.1080/00173139908559217. ^ Skovgaard, Alf (1998). “Role of chloroplast retention in a marine dinoflagellate”. Aquatic Microbial Ecology. 15: 293–301. doi:10.3354/ame015293. ^ Dorrell, Richard G.; Howe, Christopher J. (2015-08-18). “Integration of plastids with their hosts: Lessons learned from dinoflagellates”. Proceedings of the National Academy of Sciences. 112 (33): 10247–10254. Bibcode:2015PNAS..11210247D. doi:10.1073/pnas.1421380112. ISSN 0027-8424. PMC 4547248. PMID 25995366. ^ “ctDNA — chloroplast DNA”. AllAcronyms.com. Retrieved 2 January 2013. ^ The Oxford Dictionary of Abbreviations. ctDNA—Dictionary definition. 1998. ^ “Chloroplasts and Other Plastids”. University of Hamburg. Archived from the original on 25 September 2012. Retrieved 27 December 2012. ^ a b c d e f g Sandelius, Anna Stina (2009). The Chloroplast: Interactions with the Environment. Springer. p. 18. ISBN 978-3-540-68696-5. ^ a b Burgess, Jeremy (1989). An introduction to plant cell development. Cambridge: Cambridge university press. p. 62. ISBN 0-521-31611-1. ^ Bendich, A. J. (2004). “Circular Chloroplast Chromosomes: The Grand Illusion”. The Plant Cell Online. 16 (7): 1661–6. doi:10.1105/tpc.160771. PMC 514151. PMID 15235123. ^ a b c Kolodner, R.; Tewari, KK (1979). “Inverted Repeats in Chloroplast DNA from Higher Plants”. Proceedings of the National Academy of Sciences. 76 (1): 41–5. Bibcode:1979PNAS…76…41K. doi:10.1073/pnas.76.1.41. PMC 382872. PMID 16592612. ^ a b Palmer, Jeffrey D.; Thompson, William F. (1982). “Chloroplast DNA rearrangements are more frequent when a large inverted repeat sequence is lost”. Cell. 29 (2): 537–50. doi:10.1016/0092-8674(82)90170-2. PMID 6288261. ^ Plant Biochemistry (3rd ed.). Academic Press. 2005. p. 517. ISBN 978-0-12-088391-2. ^ a b Kobayashi, T.; Takahara, M; Miyagishima, SY; Kuroiwa, H; Sasaki, N; Ohta, N; Matsuzaki, M; Kuroiwa, T (2002). “Detection and Localization of a Chloroplast-Encoded HU-Like Protein That Organizes Chloroplast Nucleoids”. The Plant Cell Online. 14 (7): 1579–89. doi:10.1105/tpc.002717. PMC 150708. PMID 12119376. ^ Odahara M, Kishita Y, Sekine Y (August 2017). “MSH1 maintains organelle genome stability and genetically interacts with RECA and RECG in the moss Physcomitrella patens”. Plant J. 91 (3): 455–465. doi:10.1111/tpj.13573. PMID 28407383. ^ Rowan BA, Oldenburg DJ, Bendich AJ (June 2010). “RecA maintains the integrity of chloroplast DNA molecules in Arabidopsis”. J. Exp. Bot. 61 (10): 2575–88. doi:10.1093/jxb/erq088. PMC 2882256. PMID 20406785. ^ a b c d e f Krishnan, Rao BJ, NM (2009). “A comparative approach to elucidate chloroplast genome replication”. BMC Genomics. 10 (237). doi:10.1186/1471-2164-10-237. PMC 2695485. PMID 19457260. ^ Heinhorst, Gordon C. Cannon, Sabine (1993). “DNA replication in chloroplasts”. Journal of Cell Science. 104: 1–9. ^ a b c d e f Bendich, AJ (2004). “Circular Chloroplast Chromosomes: The Grand Illusion”. The Plant Cell. 16 (7): 1661–1666. doi:10.1105/tpc.160771. PMC 514151. PMID 15235123. ^ “Effect of chemical mutagens on nucleotide sequence”. Biocyclopedia. Retrieved 24 October 2015. ^ Bernstein H, Bernstein C (July 1973). “Circular and branched circular concatenates as possible intermediates in bacteriophage T4 DNA replication”. J. Mol. Biol. 77 (3): 355–61. PMID 4580243. ^ a b Alberts, Bruce (2002). Molecular biology of the cell (4. ed.). New York [u.a. ]: Garland. ISBN 0-8153-4072-9. ^ Huang, Chun Y.; Ayliffe, Michael A.; Timmis, Jeremy N. (2003). “Direct measurement of the transfer rate of chloroplast DNA into the nucleus”. Nature. 422 (6927): 72–6. Bibcode:2003Natur.422…72H. doi:10.1038/nature01435. PMID 12594458. ^ a b c Martin, W.; Rujan, T; Richly, E; Hansen, A; Cornelsen, S; Lins, T; Leister, D; Stoebe, B; Hasegawa, M; Penny, D (2002). “Evolutionary analysis of Arabidopsis, cyanobacterial, and chloroplast genomes reveals plastid phylogeny and thousands of cyanobacterial genes in the nucleus”. Proceedings of the National Academy of Sciences. 99 (19): 12246–51. Bibcode:2002PNAS…9912246M. doi:10.1073/pnas.182432999. PMC 129430. PMID 12218172. ^ Smith, David Roy; Lee, Robert W. (2014-04-01). “A Plastid without a Genome: Evidence from the Nonphotosynthetic Green Algal Genus Polytomella”. Plant Physiology. 164 (4): 1812–1819. doi:10.1104/pp.113.233718. PMC 3982744. PMID 24563281. ^ Archibald, John M. (2006). “Algal Genomics: Exploring the Imprint of Endosymbiosis”. Current Biology. 16 (24): R1033–5. doi:10.1016/j.cub.2006.11.008. PMID 17174910. ^ Koussevitzky, Shai; Nott, A; Mockler, TC; Hong, F; Sachetto-Martins, G; Surpin, M; Lim, J; Mittler, R; Chory, J (2007). “Signals from Chloroplasts Converge to Regulate Nuclear Gene Expression”. Science. 316 (5825): 715–9. Bibcode:2007Sci…316..715K. doi:10.1126/science.1140516. PMID 17395793. ^ Hedtke, B.; Börner, T; Weihe, A (1997). “Mitochondrial and Chloroplast Phage-Type RNA Polymerases in Arabidopsis”. Science. 277 (5327): 809–11. doi:10.1126/science.277.5327.809. PMID 9242608. ^ Harris, EH; Boynton, JE; Gillham, NW (1994). “Chloroplast ribosomes and protein synthesis”. Microbiological Reviews. 58 (4): 700–54. PMC 372988. PMID 7854253. ^ a b c d e f g h i j Soll, Jürgen; Schleiff, Enrico (2004). “Plant cell biology: Protein import into chloroplasts”. Nature Reviews Molecular Cell Biology. 5 (3): 198–208. doi:10.1038/nrm1333. PMID 14991000. ^ Biology 8th edition—Campbell & Reece. Benjamin Cummings. 2008. p. 340. ISBN 978-0-321-54325-7. ^ Lung, S.-C.; Chuong, S. D. X. (2012). “A Transit Peptide-Like Sorting Signal at the C Terminus Directs the Bienertia sinuspersici Preprotein Receptor Toc159 to the Chloroplast Outer Membrane”. The Plant Cell. 24 (4): 1560–78. doi:10.1105/tpc.112.096248. PMC 3398564. PMID 22517318. ^ Soll, J r.; Soll, J (1996). “Phosphorylation of the Transit Sequence of Chloroplast Precursor Proteins”. Journal of Biological Chemistry. 271 (11): 6545–54. doi:10.1074/jbc.271.11.6545. PMID 8626459. ^ a b May, T. (2000). “14-3-3 Proteins Form a Guidance Complex with Chloroplast Precursor Proteins in Plants”. The Plant Cell Online. 12: 53–64. doi:10.1105/tpc.12.1.53. PMC 140214. PMID 10634907. ^ Jarvis, Paul; Soll, Jürgen (2001). “Toc, Tic, and chloroplast protein import”. Biochimica et Biophysica Acta (BBA) – Molecular Cell Research. 1541 (1–2): 64–79. doi:10.1016/S0167-4889(01)00147-1. PMID 11750663. ^ Wise, R.R. ; Hoober, J.K. (2007). The Structure and Function of Plastids. Springer. pp. 32–33. ISBN 978-1-4020-6570-5. ^ “Oedogonium Link ex Hirn, 1900: 17”. algaeBASE. Retrieved 19 May 2013. ^ “Chlamydomonas Ehrenberg, 1833: 288”. algaeBASE. Retrieved 19 May 2013. ^ “Spirogyra Link, 1820: 5”. algaeBASE. Retrieved 19 May 2013. ^ “Sirogonium Kützing, 1843: 278”. algaeBASE. Retrieved 19 May 2013. ^ “Zygnema C.Agardh, 1817: xxxii, 98”. algaeBASE. Retrieved 19 May 2013. ^ “Micrasterias C.Agardh ex Ralfs, 1848: 68”. algaeBASE. Retrieved 19 May 2013. ^ John, D.M. ; Brook, A.J. ; Whitton, B.A. (2002). The freshwater algal flora of the British Isles : an identification guide to freshwater and terrestrial algae. Cambridge: Cambridge University Press. p. 335. ISBN 978-0-521-77051-4. ^ a b c d e f g Biology 8th edition—Campbell & Reece. Benjamin Cummings. 2008. pp. 196–197. ISBN 978-0-321-54325-7. ^ Koike, H.; Yoshio, M.; Kashino, Y.; Satoh, K. (1998). “Polypeptide Composition of Envelopes of Spinach Chloroplasts: Two Major Proteins Occupy 90% of Outer Envelope Membranes”. Plant and Cell Physiology. 39 (5): 526–32. doi:10.1093/oxfordjournals.pcp.a029400. PMID 9664716. ^ Köhler RH, Hanson MR (1 January 2000). “Plastid tubules of higher plants are tissue-specific and developmentally regulated”. J. Cell Sci. 113 (Pt 1): 81–9. PMID 10591627. Archived from the original on 18 November 2010. ^ Gray JC, Sullivan JA, Hibberd JM, Hansen MR (2001). “Stromules: mobile protrusions and interconnections between plastids”. Plant Biology. 3 (3): 223–33. doi:10.1055/s-2001-15204. ^ Schattat, M.; Barton, K.; Baudisch, B.; Klösgen, R. B.; Mathur, J. (2011). “Plastid Stromule Branching Coincides with Contiguous Endoplasmic Reticulum Dynamics”. Plant Physiology. 155 (4): 1667–77. doi:10.1104/pp.110.170480. PMC 3091094. PMID 21273446. ^ Schattat, M. H.; Griffiths, S.; Mathur, N.; Barton, K.; Wozny, M. R.; Dunn, N.; Greenwood, J. S.; Mathur, J. (2012). “Differential Coloring Reveals That Plastids Do Not Form Networks for Exchanging Macromolecules”. The Plant Cell. 24 (4): 1465–77. doi:10.1105/tpc.111.095398. PMC 3398557. PMID 22474180. ^ Brunkard, Jacob O.; Runkel, Anne M.; Zambryski, Patricia C. (2015). “Chloroplasts extend stromules independently and in response to internal redox signals”. PNAS. 112 (32): 10044–10049. Bibcode:2015PNAS..11210044B. doi:10.1073/pnas.1511570112. PMC 4538653. PMID 26150490. ^ a b c d e f g h i j Burgess,, Jeremy (1989). An introduction to plant cell development (Pbk. ed.). Cambridge: Cambridge university press. p. 46. ISBN 0-521-31611-1. ^ a b Whatley, Jean M (5 July 1994). “The occurrence of a peripheral reticulum in plastids of the gymnosperm Welwitschia mirabilis”. New Phytologist. 74 (2): 215–220. doi:10.1111/j.1469-8137.1975.tb02608.x. ^ a b c Wise, Robert R (2007). The Structure and Function of Plastids. Springer. pp. 17–18. ISBN 978-1-4020-6570-5. ^ Manuell, Andrea L.; Quispe, Joel; Mayfield, Stephen P. (2007). “Structure of the Chloroplast Ribosome: Novel Domains for Translation Regulation”. PLoS Biology. 5 (8): e209. doi:10.1371/journal.pbio.0050209. PMC 1939882. PMID 17683199. ^ a b Lim, K.; Kobayashi, I.; Nakai, K. (7 April 2014). “Alterations in rRNA-mRNA Interaction during Plastid Evolution”. Molecular Biology and Evolution. 31 (7): 1728–1740. doi:10.1093/molbev/msu120. PMID 24710516. ^ Hirose, T; Sugiura, M (January 2004). “Functional Shine-Dalgarno-like sequences for translational initiation of chloroplast mRNAs”. Plant & cell physiology. 45 (1): 114–7. doi:10.1093/pcp/pch002. PMID 14749493. ^ Ma, J; Campbell, A; Karlin, S (October 2002). “Correlations between Shine-Dalgarno sequences and gene features such as predicted expression levels and operon structures”. Journal of Bacteriology. 184 (20): 5733–45. doi:10.1128/JB.184.20.5733-5745.2002. PMC 139613. PMID 12270832. ^ Lim, K; Furuta, Y; Kobayashi, I (October 2012). “Large variations in bacterial ribosomal RNA genes”. Molecular Biology and Evolution. 29 (10): 2937–48. doi:10.1093/molbev/mss101. PMC 3457768. PMID 22446745. ^ a b c d e f g h i j Austin, J. R.; Frost, E; Vidi, PA; Kessler, F; Staehelin, LA (2006). “Plastoglobules Are Lipoprotein Subcompartments of the Chloroplast That Are Permanently Coupled to Thylakoid Membranes and Contain Biosynthetic Enzymes”. The Plant Cell Online. 18 (7): 1693–703. doi:10.1105/tpc.105.039859. PMC 1488921. PMID 16731586. ^ a b Crumpton-Taylor, M.; Grandison, S.; Png, K. M. Y.; Bushby, A. J.; Smith, A. M. (2011). “Control of Starch Granule Numbers in Arabidopsis Chloroplasts”. Plant Physiology. 158 (2): 905–16. doi:10.1104/pp.111.186957. PMC 3271777. PMID 22135430. ^ Zeeman, Samuel C.; Delatte, Thierry; Messerli, Gaëlle; Umhang, Martin; Stettler, Michaela; Mettler, Tabea; Streb, Sebastian; Reinhold, Heike; Kötting, Oliver (2007). “Starch breakdown: Recent discoveries suggest distinct pathways and novel mechanisms”. Functional Plant Biology. 34 (6): 465–73. doi:10.1071/FP06313. ^ J D, Rochaix (1998). The molecular biology of chloroplasts and mitochondria in Chlamydomonas. Dordrecht [u.a. ]: Kluwer Acad. Publ. pp. 550–565. ISBN 978-0-7923-5174-0. ^ a b c d e f Steer, Brian E.S. Gunning, Martin W. (1996). Plant cell biology : structure and function. Boston, Mass. : Jones and Bartlett Publishers. p. 24. ISBN 0-86720-504-0. ^ Hanson, David; Andrews, T. John; Badger, Murray R. (2002). “Variability of the pyrenoid-based CO2 concentrating mechanism in hornworts (Anthocerotophyta)”. Functional Plant Biology. 29 (3): 407–16. doi:10.1071/PP01210. ^ a b Ma, Y.; Pollock, S. V.; Xiao, Y.; Cunnusamy, K.; Moroney, J. V. (2011). “Identification of a Novel Gene, CIA6, Required for Normal Pyrenoid Formation in Chlamydomonas reinhardtii”. Plant Physiology. 156 (2): 884–96. doi:10.1104/pp.111.173922. PMC 3177283. PMID 21527423. ^ a b Retallack, B; Butler, RD (1970). “The development and structure of pyrenoids in Bulbochaete hiloensis”. Journal of Cell Science. 6 (1): 229–41. PMID 5417694. ^ Brown, Malcolm R; Howard J Arnott (1970). “Structure and Function of the Algal Pyrenoid” (PDF). Journal of Phycology. 6: 14–22. doi:10.1111/j.1529-8817.1970.tb02350.x. Archived from the original (PDF) on 31 May 2013. Retrieved 31 December 2012. ^ a b c d e f Mustardy, L.; Buttle, K.; Steinbach, G.; Garab, G. (2008). “The Three-Dimensional Network of the Thylakoid Membranes in Plants: Quasihelical Model of the Granum-Stroma Assembly”. The Plant Cell Online. 20 (10): 2552–7. doi:10.1105/tpc.108.059147. PMC 2590735. PMID 18952780. ^ a b c Austin, J. R.; Staehelin, L. A. (2011). “Three-Dimensional Architecture of Grana and Stroma Thylakoids of Higher Plants as Determined by Electron Tomography”. Plant Physiology. 155 (4): 1601–11. doi:10.1104/pp.110.170647. PMC 3091084. PMID 21224341. ^ Infanger, S; Bischof, S; Hiltbrunner, A; Agne, B; Baginsky, S; Kessler, F (2011). “The Chloroplast Import Receptor Toc90 Partially Restores the Accumulation of Toc159 Client Proteins in the Arabidopsis thaliana ppi2 Mutant”. Molecular Plant. 4 (2): 252–63. doi:10.1093/mp/ssq071. PMID 21220583. ^ “thylakoid”. Merriam-Webster Dictionary. Merriam-Webster. Retrieved 19 May 2013. ^ a b c Biology 8th Edition Campbell & Reece. Benjamin Cummings (Pearson). 2009. pp. 190–193. ^ “Australian scientists discover first new chlorophyll in 60 years”. University of Sydney. 20 August 2010. ^ a b c Takaichi, Shinichi (15 June 2011). “Carotenoids in Algae: Distributions, Biosyntheses and Functions”. Marine Drugs. 9 (12): 1101–1118. doi:10.3390/md9061101. PMC 3131562. PMID 21747749. ^ Shapley, Dan. “Why Do Leaves Change Color in Fall?”. News Articles. Retrieved 21 May 2013. ^ a b Howe, C.J; Barbrook, A.C; Nisbet, R.E.R; Lockhart, P.J; Larkum, A.W.D (2008). “The origin of plastids”. Philosophical Transactions of the Royal Society B: Biological Sciences. 363 (1504): 2675–85. doi:10.1098/rstb.2008.0050. PMC 2606771. PMID 18468982. ^ “Introduction to the Rhodophyta”. University of California Museum of Paleontology. Retrieved 20 May 2013. ^ a b c d e f g Biology 8th Edition Campbell & Reece. Benjamin Cummings (Pearson). 2009. pp. 200–201. ^ Lawton, June R (March 1988). “Ultrastructure of Chloroplast Membranes in Leaves of Maize and Ryegrass as Revealed by Selective Staining Methods”. New Phytologist. 108 (3): 277–283. doi:10.1111/j.1469-8137.1988.tb04163.x. JSTOR 2433294. ^ Biology 8th edition—Campbell&Reece. Benjamin Cummings. 2008. p. 742. ISBN 978-0-321-54325-7. ^ a b Eckardt, N. A. (2003). “Controlling Organelle Positioning: A Novel Chloroplast Movement Protein”. The Plant Cell Online. 15 (12): 2755–7. doi:10.1105/tpc.151210. PMC 540263. ^ a b c d e f g h i j k l Glynn, Jonathan M.; Miyagishima, Shin-ya; Yoder, David W.; Osteryoung, Katherine W.; Vitha, Stanislav (2007). “Chloroplast Division”. Traffic. 8 (5): 451–61. doi:10.1111/j.1600-0854.2007.00545.x. PMID 17451550. ^ a b Dong, X.-J. ; Nagai, R.; Takagi, S. (1998). “Microfilaments Anchor Chloroplasts along the Outer Periclinal Wall in Vallisneria Epidermal Cells through Cooperation of PFR and Photosynthesis”. Plant and Cell Physiology. 39 (12): 1299–306. doi:10.1093/oxfordjournals.pcp.a029334. ^ a b c Takagi, Shingo (December 2002). “Actin-based photo-orientation movement of chloroplasts in plant cells”. Journal of Experimental Biology. 206: 1963–1969. doi:10.1242/jeb.00215. Retrieved 6 March 2013. ^ Zeiger, E.; Talbott, L. D.; Frechilla, S.; Srivastava, A.; Zhu, J. (2002). “The guard cell chloroplast: A perspective for the twenty-first century”. New Phytologist. 153 (3): 415–424. doi:10.1046/j.0028-646X.2001.NPH328.doc.x. ^ a b c d e f g Padmanabhan, Meenu S.; Dinesh-Kumar, S. P. (2010). “All Hands on Deck—The Role of Chloroplasts, Endoplasmic Reticulum, and the Nucleus in Driving Plant Innate Immunity”. Molecular Plant-Microbe Interactions. 23 (11): 1368–80. doi:10.1094/MPMI-05-10-0113. PMID 20923348. ^ Katsir, Leron; Chung, Hoo Sun; Koo, Abraham JK; Howe, Gregg A (2008). “Jasmonate signaling: A conserved mechanism of hormone sensing”. Current Opinion in Plant Biology. 11 (4): 428–35. doi:10.1016/j.pbi.2008.05.004. PMC 2560989. PMID 18583180. ^ Schnurr, J. A.; Shockey, JM; De Boer, GJ; Browse, JA (2002). “Fatty Acid Export from the Chloroplast. Molecular Characterization of a Major Plastidial Acyl-Coenzyme a Synthetase from Arabidopsis”. Plant Physiology. 129 (4): 1700–9. doi:10.1104/pp.003251. PMC 166758. PMID 12177483. ^ a b c d Biology—Concepts and Connections. Pearson. 2009. pp. 108–118. ^ Jagendorf A. T. and E. Uribe (1966). “ATP formation caused by acid-base transition of spinach chloroplasts”. Proc. Natl. Acad. Sci. USA. 55: 170–177. Bibcode:1966PNAS…55..170J. doi:10.1073/pnas.55.1.170. PMC 285771. ^ a b Clarke, Jeremy M. Berg; John L. Tymoczko; Lubert Stryer. Web content by Neil D. (2002). Biochemistry (5. ed., 4. print. ed.). New York, NY [u.a. ]: W. H. Freeman. pp. Section 19.4. ISBN 0-7167-3051-0. ^ a b Clarke, Jeremy M. Berg; John L. Tymoczko; Lubert Stryer. Web content by Neil D. (2002). Biochemistry (5. ed., 4. print. ed.). New York, NY [u.a. ]: W. H. Freeman. pp. Section 20.1. ISBN 0-7167-3051-0. ^ a b c Wample, R. L.; Davis, R. W. (1983). “Effect of Flooding on Starch Accumulation in Chloroplasts of Sunflower (Helianthus annuus L.)”. Plant Physiology. 73 (1): 195–8. doi:10.1104/pp.73.1.195. PMC 1066435. PMID 16663176. ^ Carmi, A.; Shomer, I. (1979). “Starch Accumulation and Photosynthetic Activity in Primary Leaves of Bean (Phaseolus vulgaris L.)”. Annals of Botany. 44 (4): 479–484. ^ Berg JM; Tymoczko JL; Stryer L. (2002). Biochemistry (5th ed.). W H Freeman. pp. Section 19.4. Retrieved 30 October 2012. ^ a b c Hauser, M; Eichelmann, H; Oja, V; Heber, U; Laisk, A (1995). “Stimulation by Light of Rapid pH Regulation in the Chloroplast Stroma in Vivo as Indicated by CO2 Solubilization in Leaves”. Plant Physiology. 108 (3): 1059–1066. doi:10.1104/pp.108.3.1059. PMC 157457. PMID 12228527. ^ a b Werdan, Karl; Heldt, Hans W.; Milovancev, Mirjana (1975). “The role of pH in the regulation of carbon fixation in the chloroplast stroma. Studies on CO2 fixation in the light and dark”. Biochimica et Biophysica Acta (BBA) – Bioenergetics. 396 (2): 276–92. doi:10.1016/0005-2728(75)90041-9. PMID 239746. ^ a b c d e f g Burgess,, Jeremy (1989). An introduction to plant cell development. Cambridge: Cambridge university press. p. 56. ISBN 0-521-31611-1. ^ Ferro, Myriam; Daniel Salvi; Hélène Rivière-Rolland; Thierry Vermat; Daphné Seigneurin-Berny; Didier Grunwald; Jérôme Garin; Jacques Joyard; Norbert Rolland (20 August 2002). “Integral membrane proteins of the chloroplast envelope: Identification and subcellular localization of new transporters”. Proceedings of the National Academy of Sciences. 99 (17): 11487–11492. Bibcode:2002PNAS…9911487F. doi:10.1073/pnas.172390399. PMC 123283. PMID 12177442. ^ a b Rolland, Norbert; Michel Droux; Roland Douce (March 1992). “Subcellular Distribution of O-Acetylserine(thiol)lyase in Cauliflower (Brassica oleracea L.) Inflorescence”. Plant Physiology. 98 (3): 927–935. doi:10.1104/pp.98.3.927. PMC 1080289. ^ Ravanel, Stéphane; Bertrand Gakière; Dominique Job; Roland Douce (23 June 1998). “The specific features of methionine biosynthesis and metabolism in plants”. Proceedings of the National Academy of Sciences. 95 (13): 7805–7812. Bibcode:1998PNAS…95.7805R. doi:10.1073/pnas.95.13.7805. PMC 22764. PMID 9636232. ^ a b c d e Buchanan BB, Gruissem W, Jones RL (Eds.). 2015. Biochemistry & Molecular Biology of Plants. Wiley Blackwell. ^ Joyard, Jacques; Ferro, Myriam; Masselon, Christophe; Seigneurin-Berny, Daphné; Salvi, Daniel; Garin, Jérôme; Rolland, Norbert (2010). “Chloroplast proteomics highlights the subcellular compartmentation of lipid metabolism”. Progress in Lipid Research. 49 (2): 128–58. doi:10.1016/j.plipres.2009.10.003. PMID 19879895. ^ Proudlove MO, Thurman DA. 1981. The uptake of 2‐oxoglutarate and pyruvate by isolated pea chloroplasts. New Phytologist 88, 255–264. ^ Bao X, Focke M, Pollard M, Ohlrogge J. 2000. Understanding in vivo carbon precursor supply for fatty acid synthesis in leaf tissue. Plant Journal 22, 39–50. ^ Ohlrogge J, Browse J. 1995. Lipid Biosynthesis. The Plant Cell 7, 957–970. ^ Steer, Brian E.S. Gunning, Martin W. (1996). Plant cell biology : structure and function. Boston, Mass. : Jones and Bartlett Publishers. p. 20. ISBN 0-86720-504-0. ^ a b c d e Burgess,, Jeremy (1989). An introduction to plant cell development (Pbk. ed.). Cambridge: Cambridge university press. pp. 54–55. ISBN 0-521-31611-1. ^ Burgess,, Jeremy (1989). An introduction to plant cell development (Pbk. ed.). Cambridge: Cambridge university press. p. 57. ISBN 0-521-31611-1. ^ a b Possingham, J. V.; Rose, R. J. (1976). “Chloroplast Replication and Chloroplast DNA Synthesis in Spinach Leaves”. Proceedings of the Royal Society B: Biological Sciences. 193 (1112): 295–305. Bibcode:1976RSPSB.193..295P. doi:10.1098/rspb.1976.0047. ^ Heinhorst, S; G.C. Cannon (January 1993). “DNA replication in chloroplasts”. Journal of Cell Science. 104 (104): 1–9. Retrieved 3 February 2013. ^ a b c d e f g h i Miyagishima, S.-y. ; Nishida, K; Mori, T; Matsuzaki, M; Higashiyama, T; Kuroiwa, H; Kuroiwa, T (2003). “A Plant-Specific Dynamin-Related Protein Forms a Ring at the Chloroplast Division Site”. The Plant Cell Online. 15 (3): 655–65. doi:10.1105/tpc.009373. PMC 150020. PMID 12615939. ^ a b Hashimoto, H.; Possingham, J. V. (1989). “Effect of Light on the Chloroplast Division Cycle and DNA Synthesis in Cultured Leaf Discs of Spinach”. Plant Physiology. 89 (4): 1178–83. doi:10.1104/pp.89.4.1178. PMC 1055993. PMID 16666681. ^ a b c d Hansen, A. K.; Escobar, L. K.; Gilbert, L. E.; Jansen, R. K. (2007). “Paternal, maternal, and biparental inheritance of the chloroplast genome in Passiflora (Passifloraceae): Implications for phylogenetic studies” (PDF). American Journal of Botany. 94 (1): 42–6. doi:10.3732/ajb.94.1.42. PMID 21642206. ^ Birky, C. William (1995). “Uniparental Inheritance of Mitochondrial and Chloroplast Genes: Mechanisms and Evolution”. Proceedings of the National Academy of Sciences. 92 (25): 11331–8. Bibcode:1995PNAS…9211331B. doi:10.1073/pnas.92.25.11331. PMC 40394. PMID 8524780.